Newly archived sections are placed at the top of this page. This page contains archived news from October-December 2018. There will be a series of railtours both to and from North Wales in 2018 while de-fuelling and removing contaminated material from Wylfa Nuclear Power Station will continue for another year at least providing the only freight traffic on the route. In recent years steam on the North Wales Coast/Blaenau Ffestiniog has declined and steam on the Cambrian disappeared due to NR reneging on its promise to provide a mobile ERTMS unit. Railtours are diesel hauled unless otherwise specified. It is good to see a few railtours starting from Bangor but sad to see nothing on the Cambrian again! 14/4/18 'North Wales Coast Express' Crewe to Llandudno/Holyhead (steam throughout on main line) from Crewe Saphos Rail. 28/4/18 'The Ynys Mon Express' Leicester to Holyhead (steam) Tornado UKRT. 2/6/18 'North Wales Coast Express' Crewe to Llandudno/Holyhead (steam throughout on main line) Saphos Rail. 12/7/18 'The Conwy Valley Explorer' Dumfries to Betws-y-coed (47/57 throughout) West Coast Rail. 19/7/18 'The Royal Windsor Express II' Bangor (and stations to Chester) to Windsor West Coast Rail. 22/7/18 'The North Wales Coast Express' Manchester Piccadilly-Llandudno/Holyhead steam throughout on main line) RTC. 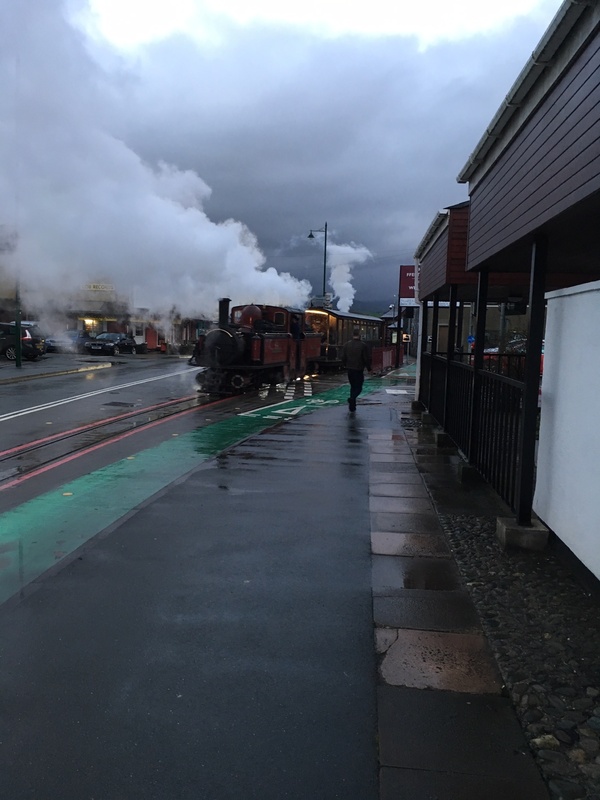 24/7/18 'The Welsh Mountaineer' Preston to Blaenau Ffestiniog (steam) RTC. 4/8/18 'The William Shakespeare' Bangor (and stations to Crewe) to Stratford-on-Avon (steam throughout) Saphos Rail. 30/8/18 'The Conwy Valley Explorer II' Harrogate to Betws-y-coed (47/57 throughout) West Coast Rail. 17/10/18 'The Pendle Dalesman III' Bangor (and stations to Chester) to Carlisle (steam Hellifield-Carlisle) West Coast Rail. 19/10/18 'Tenth Anniversary Tour' Chester to Blaenau Ffestiniog/Holyhead (Tornado) Private. This northerly view (29/12/18) shows No.143 running round at Caernarfon. Following the final trains on 1/1/19, the track will be lifted in this area and realigned along the platform face, the point moved north and the headshunt extended north to accept two Garratt locos. Click on the image to enlarge and click again to see full size (where available). This image is copyright Alasdair Stewart and was taken on a digital camera. Image post processed and displayed at 96dpi. The latest weather forecast predicts the Snowdon Ranger weather will be unusually mild at 8-10C over the next week to 31/12/18 with no snowfall, not even on Snowdon. At least this eases travel to the WHR for the 'Mince Pie' Green timetable trains 27/12/18-1/1/19 and the mountains may retain some snow cover from last week. This northerly view (23/12/18?) 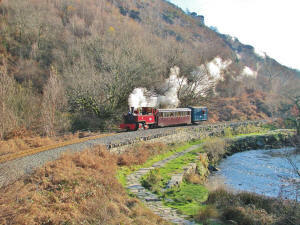 shows Taliesin and David Lloyd George hauling the morning Santa Special to Beddgelert just north of Pont Croesor. Click on the image to enlarge and click again to see full size (where available). This image is courtesy F&WHR and was taken on a digital camera. Image post processed and displayed at 96dpi. This northerly view (23/12/18?) shows No.143 running around the afternoon Santa Special after returning from Rhyd Ddu. 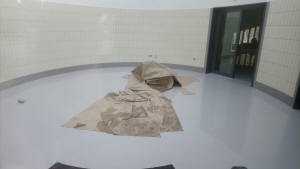 The leak in the rotunda is still in evidence and will be on the snagging list in the Spring as a large plastic sheet is protecting that part of the building. The WMWP will see the headshunt extended north and track realigned along the platform just in front of the loco. Click on the image to enlarge and click again to see full size (where available). This image is courtesy F&WHR and was taken on a digital camera. Image post processed and displayed at 96dpi. New mechanical lubricator shafts have been made and a second coat of paint has been added to the new boiler. See No.130 Facebook page for images. With the Mince Pie specials starting on 27/12/18 and continuing to New year's Day the weather around the WHR seems forecast to be depressingly mild and wet as in recent years. Temperatures of 7/8C have been forecast for 27-29 with no sign of a cold snap and no snowfall predicted even on Snowdon summit. 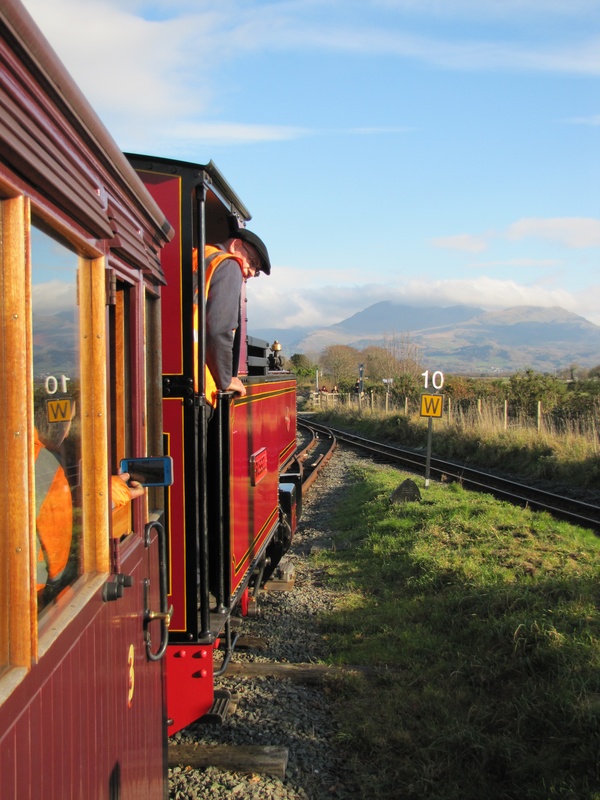 Trains will operate twice a day at 1015 and 1315 from Caernarfon to Rhyd Ddu with three and a half hours available between trains for a walk or lunch at Rhyd Ddu. What is surprising is that again there are no Boxing Day trains. This seems to be a carry over from the days when through trains were operated. Cae Pawb crossing is not available on Boxing Day as the Machynlleth signalling centre is closed for staff holidays. However, Boxing Day trains on the WHR would not require to use this section of line if operating between Caernarfon and Rhyd Ddu so it is a mystery why this disparity between the FR and WHR persists as the FR runs well filled trains on Boxing Day. Another mild wet weekend sees the final Santa Specials run for 2018. This southerly view (22/12/18) shows Taliesin and David Lloyd George hauling the 1415 afternoon Santa Special to Beddgelert crossing Pont Croesor in the low afternoon sun on one of the shortest days of the year. This beautiful view is characteristic of Roger Dimmick's excellent photography skills. Click on the image to enlarge and click again to see full size (where available). This image is copyright Roger Dimmick (F&WHR) and was taken on a digital camera. Image post processed and displayed at 96dpi. 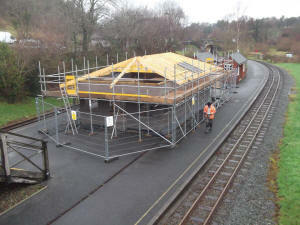 This northerly view (21/12/18) shows the roof trusses for the new Waunfawr station building erected. The site has now closed down for the Xmas break. Meanwhile, prototypical yellow bricks for the window and door surroundings have arrived at Minffordd Yard. Click on the image to enlarge and click again to see full size (where available). This image is copyright Stuart McNair (F&WHR) and was taken on a digital camera. Image post processed and displayed at 96dpi. More progress has been made with the Welsh Pony restoration. 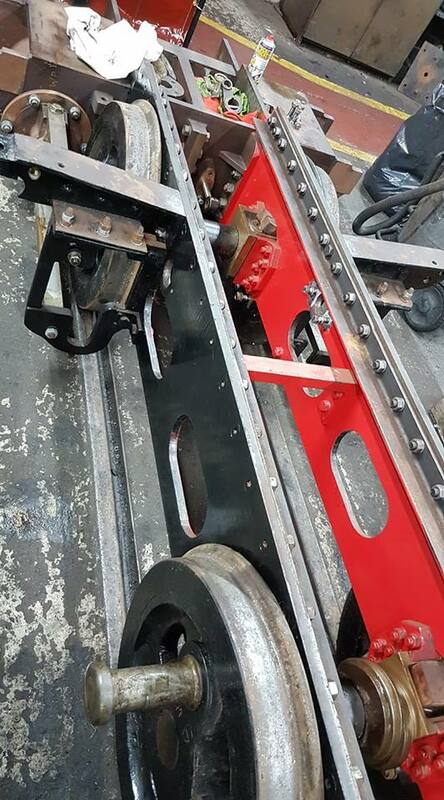 The valve gear was completed this week and the driver's vacuum brake valve and ejector are being made at the moment. The inside motion was fitted up this week and the final job before Christmas was to put final coat of paint on. After Christmas the loco goes back in to Boston Lodge and the boiler goes back on the frames for the final time. Sadly, it looks like Welsh Pony won't be ready in time for the June 'Past, Present and Future' event 21-23/6/19 that will feature Russell. 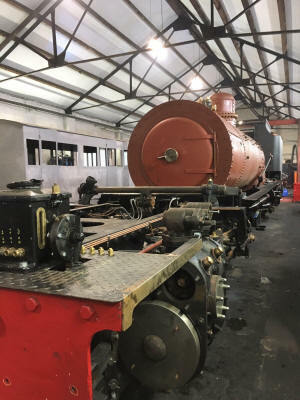 This Boston Lodge view (posted 22/12/18) shows Welsh Pony's rolling chassis ready to receive the boiler in the New Year. The inside motion has recently been completed. Click on the image to enlarge and click again to see full size (where available). This image is copyright Paul Lewin (F&WHR) and was taken on a digital camera. Image post processed and displayed at 96dpi. When Welsh Pony is completed next year it will best tested in the deep plum colour and then out-shopped in Garraway era green for the first season or two as restoration of the loco is dedicated to former FR GM Allan Garraway, who always wanted to see it completed and gave the first donation to start the project. Further progress with the cab had been made by 21/12/18. Cab details like the window frames and sliding brackets have already been added. All of the patterns and profiles are made and the glass is ready to fit. The sunshine roof (!) will be the last thing to be made. The S&T team has completed the groundwork at Rhyd Ddu and wired the location cabinets ready for installation in January of the starter signals as fitted to Beddgelert last year. The builders completed the external work on Harbour Station frontage and replaced the toilet pumping equipment on the platform (the wooden beehives). A new roof has been constructed on the Boston Lodge Loco Shed and the and Moelwyn tunnel portals are making good progress. This southerly view (14/12/18) shows Moelwyn in the new Moelwyn tunnel north portal. Many ex-Deviationists like your webmaster will see this as the final completion of the Deviation project of their youth, although not strictly of WHR interest. Click on the image to enlarge and click again to see full size (where available). This image is copyright F&WHR and was taken on a digital camera. Image post processed and displayed at 96dpi. The weather forecast suggests Snowdon will receive snow this weekend turning to rain for the final Santa Specials but nothing around the height of the railway. The weather seems to have got locked in the mild wet windy state common to recent winters. There is still time for the weather to change for the Mince Pie Specials from 27/12/18 to 1/1/19. These trains run Caernarfon to Rhyd Ddu at 10:15 and 13:15. Martin Kressman writes: The following report on the BBC Wales news website confirms that work will start this Winter, as though the earlier announcement had not been made(!) In any event, all tree trimming and felling will have to be complete by March before the start of the bird nesting season. 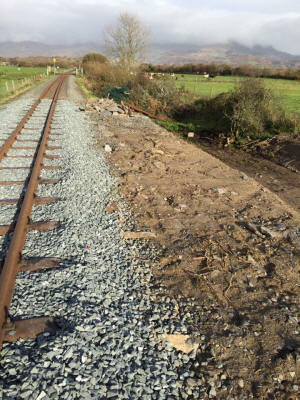 As I understand it no allowance has been made in the WHR winter maintenance programme for the construction of a haul road across the railway that will be required to the north of Bontnewydd. This too will need to be complete by the end of March and the start of the Summer train service. 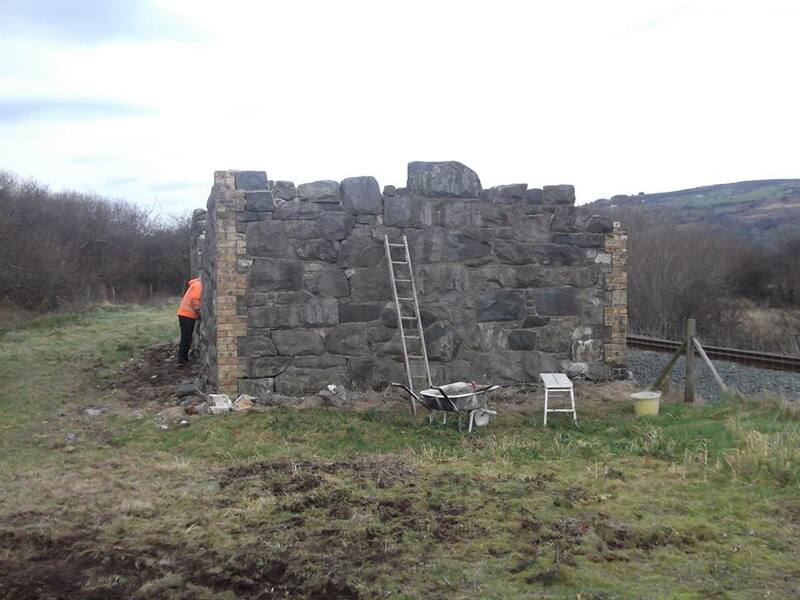 The WHHG contractor, Cyril Williams, has now completed the first part of the work restoring Betws Garmon station building. The work involved re-pointing of the stone and brickwork, including partially rebuilding certain areas and adding to the walls with available stonework. The lime mortar has to be left a while to set before placing the protective turf capping on top. Subject to the weather, the turf will be added in February. 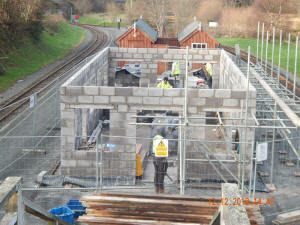 Blockwork at Waunfawr station building is now complete. The roof trusses have arrived and scaffolding for working on the roof is complete. One of the existing wooden station buildings will move to Rhyd Ddu to provide addition shelter on the platform at this exposed location. 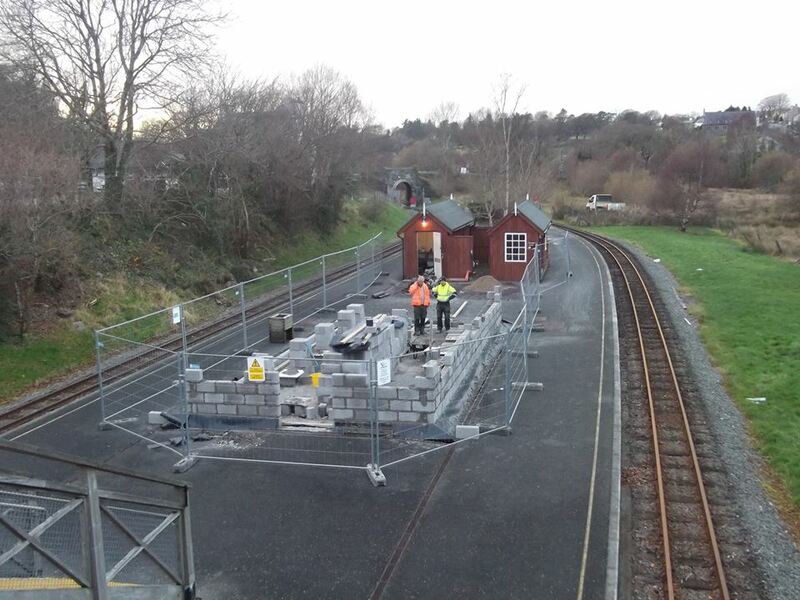 This northerly view (17/12/18) shows blockwork complete the new Waunfawr station building and scaffolding erected so that the recently delivered roof trusses can be erected and work can start on the roof over Xmas. Click on the image to enlarge and click again to see full size (where available). This image is copyright Stuart McNair (F&WHR) and was taken on a digital camera. Image post processed and displayed at 96dpi. A great deal of progress was made on just one afternoon on 17/12/18. All of the large items, cabs, coal bunker and water tank, were trial fitted to check out all of the key mountings lined up and before the task of finally mounting the boiler to the cradle starts. The engine made its first trip out into the daylight in its nearly complete form. After the boiler is fixed down, work will start on the crinoline and cladding. 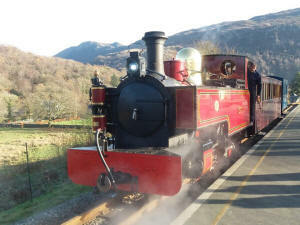 See No.130 Facebook page for several images of the loco out in the sunshine. Both WHR (Caernarfon-Rhyd Ddu) and FR (Porthmadog-Beddgelert) Santa Specials are fully booked as of 16/12/18. 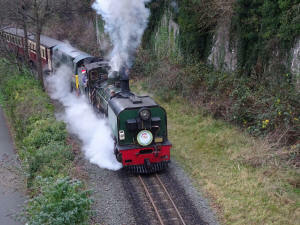 The weather for the Santa trains looks mild, misty and moist though with temperatures of 8C forecast for next weekend. It does not appear there will be a repeat of the snowy Santa Specials seen last year, though Snowdon Summit will receive a fresh covering of snow during the week. 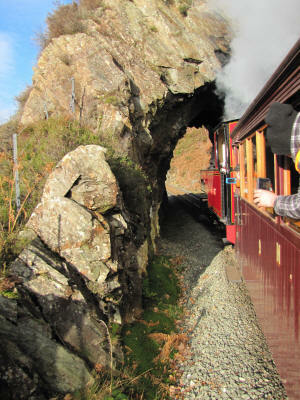 This easterly view (12/12/18) shows Taliesin running around the Santa Special at Beddgelert. David Lloyd George is topping up with water from the water crane. Click on the image to enlarge and click again to see full size (where available). This image is copyright F&WHR and was taken on a digital camera. Image post processed and displayed at 96dpi. With the boiler taken away on 12/12/18 this working party took advantage of being able to add a few more components to the list of those that could be needed for the overhaul. This was helped by the fact that volunteers also started to sort out more of the components on our storage shelves and uncovered the main regulator shaft that had made its presence scarce last month, together with the boiler's internal regulator actuation arm. While sorting out the components volunteers took the opportunity to clean and apply a coat of primer to those in need. Those components then duly moved across to the 'ready for fitting' section. One main job that was also ticked off was the trial fitting of the wear plates for the leading and trailing truck axle boxes. One of the full time staff had made these for the NG15 Group and had already tweaked one to fit it into place. Volunteers therefore fitted the other three so as they are all now ready to go for hardening. One of the plates, however, needed quite a bit of work to get it to fit. It looks like the axlebox had been built up with weld, presumably this was to compensate for where it had worn in the past, so the new plate that was made to the drawing needed to be adjusted to fit! 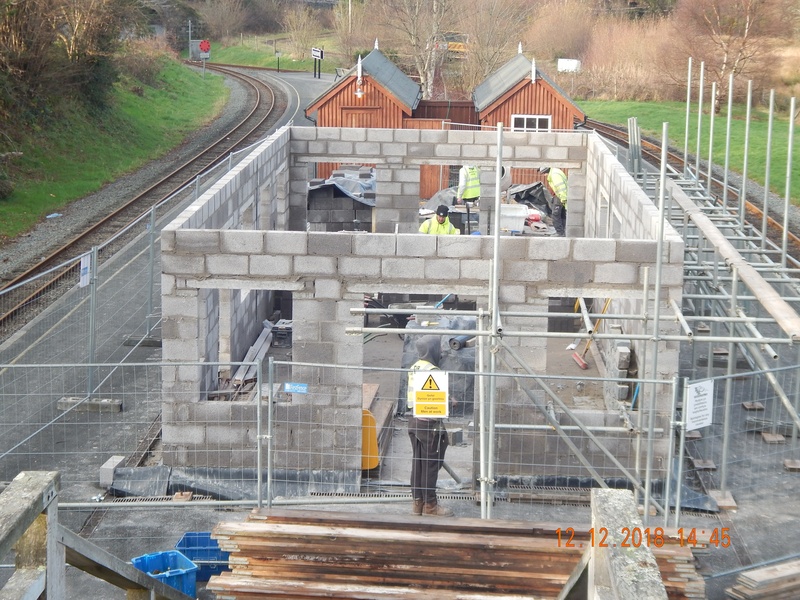 This easterly view (13/12/18) shows work taking place on the internal walls of the new Waunfawr station building. There will be public toilets, a Waiting Room and an Operations Room. Click on the image to enlarge and click again to see full size (where available). This image is copyright Stuart McNair (F&WHR) and was taken on a digital camera. Image post processed and displayed at 96dpi. Numbers of passengers travelling on the WHR have been up this year on recent years with a 7% increase by the end of August. This despite the increase in fares and the removal of the Senior Citizens Concession. In fact income had risen by 10% to the same date. Some radio advertising may have contributed to the uplift. The thieves who ransacked the temporary Caernarfon station building at Ty Seiont in mid-August were arrested and this has led to consideration of more security at the new Caernarfon station. There have been no lineside fires this year despite the scorching summer weather. This is down to good driving techniques, spark arrestors, ashpan baffles and drenches. Ffos-y-fran opencast coal (Merthyr Tyfil) has continued to be the supplier of low smoke coal. With three serviceable Garratts for the peak season there was always one spare for maintenance. This was particularly important in July with the No.143's suspension failing and subsequent derailment near Clogwin-y-Gwin footpath crossing. With No.87 now having its10 year overhaul, it is essential that the new Garratt No.130 is finished for the 2019 peak season. Ex Australian sugar cane railway PW Diesel No.9 has had a new air pump fitted and attention to gear selection and direction controls which have been simplified. Work continued on the rewire of Castell Caernarfon and the repainted bonnets were completed in green livery in September to be returned to Dinas. Some French university students interned at Boston lodge over the summer and two new DZ type underframes were produced to replace the badly corroded units on the bolster rail carrier pair. 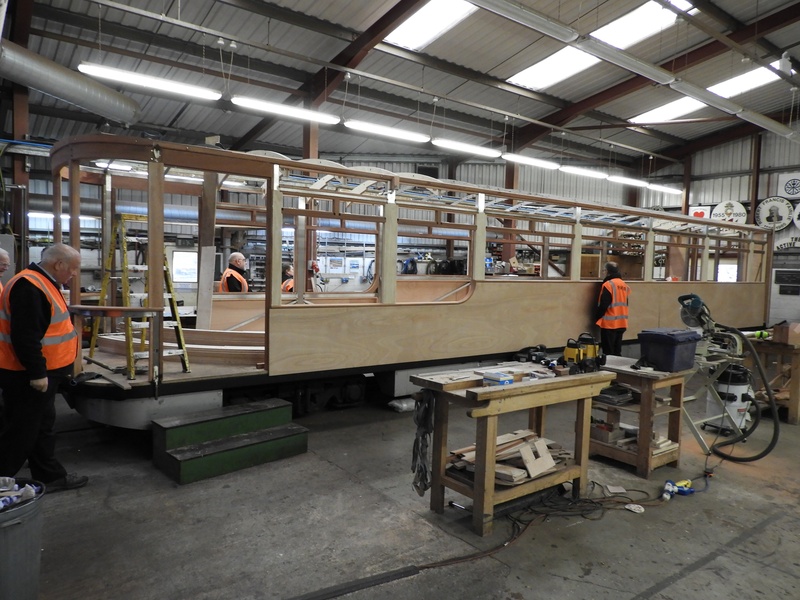 The panelling on Gwyrfai, the new WHR Observation car, has made good progress and the carriage may enter service in 2019. 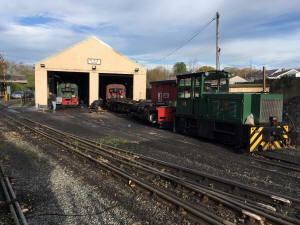 Winter maintenance on WHR Carriages is underway but delivery of parts is becoming a problem and delaying some projects. 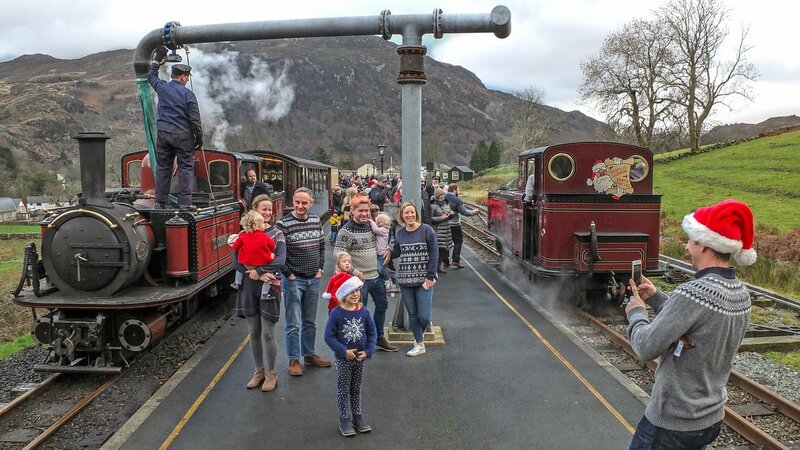 Click on the YouTube link to watch 23 mins 50 seconds of video covering Linda on a private Santa Special to Beddgelert and the arrival of No.130's boiler. Surprisingly there is no mention of Russell's visit to Beddgelert on 25/11/18, publicity for which seems to have been in the hands exclusively of the WHHR. This YouTube was published on 13/12/18 and was taken by John Wooden (F&WHR) on a professional 4K camcorder. It is best watched in 2160p 4K HD in Google Chrome browser as only 720p HD available on Windows. Alternatively, View on YouTube where all options are available. 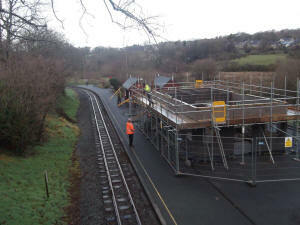 This northerly view (13/12/18) shows WHHG work taking place on Betws Garmon Halt. Stones have been recovered from inside the collapsed and robbed structure and the walls partially restored. The plan is to cap the walls with turf to minimise further deterioration. Voids excavated inside the building to recover brick and stone will likely be back-filled with slate waste or similar. Click on the image to enlarge and click again to see full size (where available). This image is copyright Stuart McNair (F&WHR) and was taken on a digital camera. Image post processed and displayed at 96dpi. 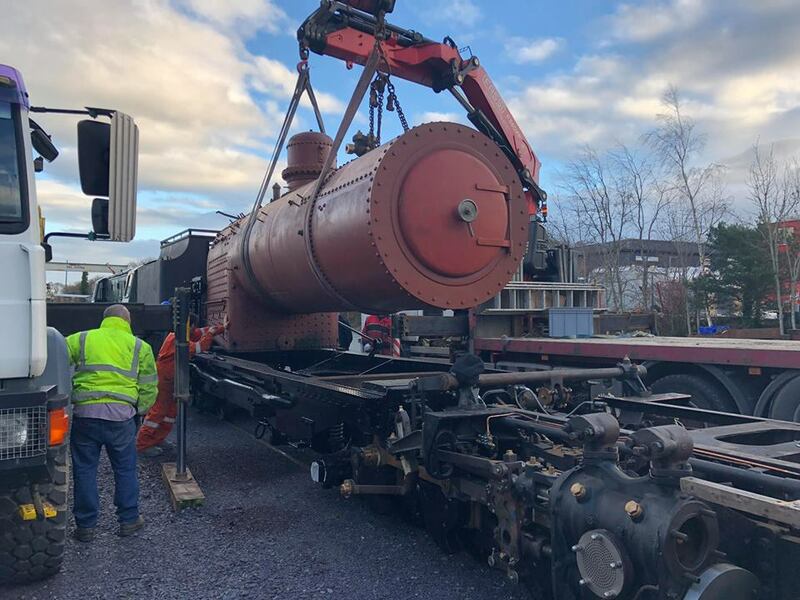 This easterly view (12/12/18) shows No.134's boiler being lifted onto the Hughes lorry in Dinas North Yard for transport to Loughborough for assessment, after No.130's boiler had been removed. Click on the image to enlarge and click again to see full size (where available). This image is copyright F&WHR and was taken on a digital camera. Image post processed and displayed at 96dpi. 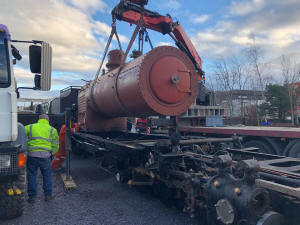 No.130's boiler arrived at Dinas on 12/12/18 and was craned into the frames which had been shunted out of the Loco Shed into the North Yard to ease the process by Vale of Ffestiniog. The Funkey is currently based at Dinas to assist the WHR Santa Specials whilst Castell Caernarfon is repaired. Local haulier Hughes Specialised Transport of Blaenau Ffestiniog was tasked with the job as a part of the F&WHR's policy of buying services locally. Two additional Hiab fitted lorries were required to unload the boiler. The boiler was suspended in mid air whilst the Funkey inched the frames into the correct position. Some parts had been removed as the boiler is a tight fit in the cradle frame e.g. blow down valves and washout plugs. For more images see F&WHR Facebook page. The next stage is to fix the boiler to the frames. Holes must be drilled in the smokebox to attach it to the saddle. Then the boiler insulation and cladding must be added and all the copper pipework. The final stages include adding the turret and fitting out the cab. This northerly view (12/12/18) shows No.130's boiler being lifted into the loco's frames in Dinas North Yard. Vale of Ffestiniog was in support to shunt the loco back to the Loco Shed. Click on the image to enlarge and click again to see full size (where available). This image is copyright F&WHR and was taken on a digital camera. Image post processed and displayed at 96dpi. This westerly view (12/12/18) shows No.130's boiler being lifted into the loco's frames in Dinas North Yard complete with new bunker. Vale of Ffestiniog was in support to shunt the loco back to the Loco shed. Click on the image to enlarge and click again to see full size (where available). This image is copyright Keith Holland and was taken on a digital camera. Image post processed and displayed at 96dpi. This northerly view (12/12/18) shows No.130's boiler in the loco's frames in Dinas North Yard complete with new bunker. Vale of Ffestiniog was in support to shunt the loco back to the Loco Shed. Click on the image to enlarge and click again to see full size (where available). This image is copyright Keith Holland and was taken on a digital camera. Image post processed and displayed at 96dpi. Keith Holland has also provided a short film clip of the loco moving with boiler. This northerly view (12/12/18) shows No.130's boiler in the loco's frames in Dinas Loco Shed complete with new bunker. No.130 will receive maximum effort to make it a working loco this season as No.87 has been withdrawn and the WHR has only two other Garratts, one of which will be withdrawn the following year. On the left is the Combination Car No.1001 being refurbished as a volunteer project. Click on the image to enlarge and click again to see full size (where available). This image is copyright Keith Holland and was taken on a digital camera. Image post processed and displayed at 96dpi. 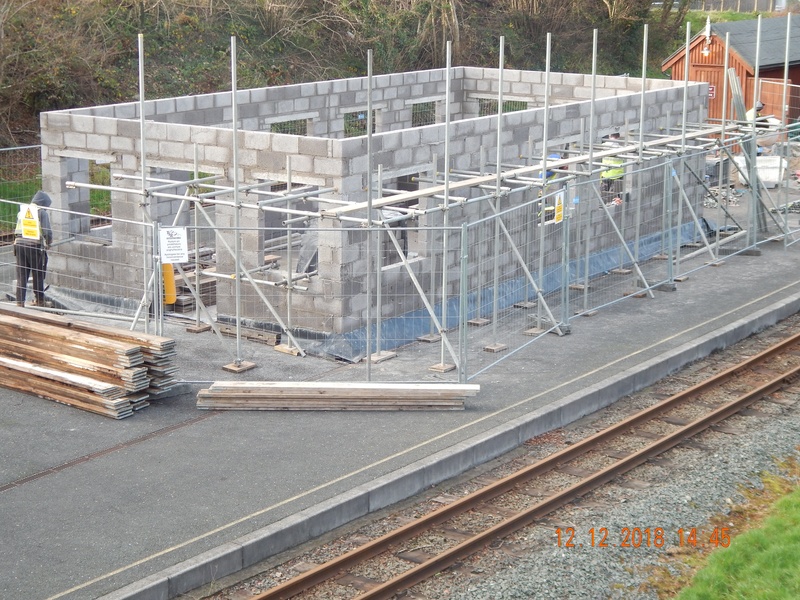 This northerly view (8/12/18) shows Waunfawr Station building has now reached Eaves level in the initial breezeblock construction phase. Doors and windows spaces are now complete on all sides giving an idea of how the final building will look. Scaffolding is being erected to allow progress to be made with the roof. Planking has been delivered for the raised working platform. Three man are at work on the contract. Cladding with local stone, including smaller stones from the original building stored under the footbridge, will start later. Click on the image to enlarge and click again to see full size (where available). This image is copyright Dai Jones and was taken on a digital camera. Image post processed and displayed at 96dpi. This westerly view (8/12/18) shows the scaffolding on the east elevation which has no doors. Click on the image to enlarge and click again to see full size (where available). This image is copyright Dai Jones and was taken on a digital camera. Image post processed and displayed at 96dpi. 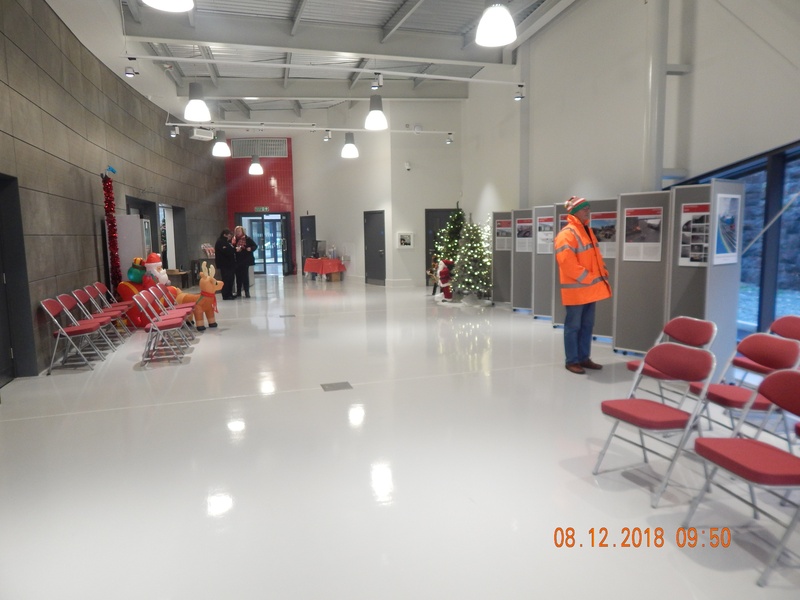 This southerly view (8/12/18) shows the Exhibition area in Caernarfon Station building which serves as a waiting hall for Santa Specials during inclement weather, complete with 'Executive' toilets on right. 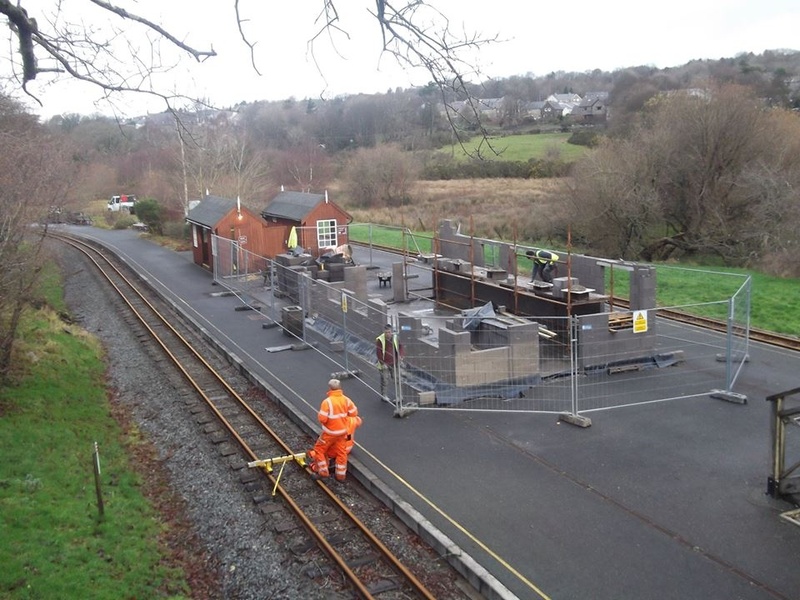 The WHR moved out of Ty Seiont, the temporary building at the south end of the platform in early December in time for the Santa Specials. Click on the image to enlarge and click again to see full size (where available). This image is copyright Dai Jones and was taken on a digital camera. Image post processed and displayed at 96dpi. 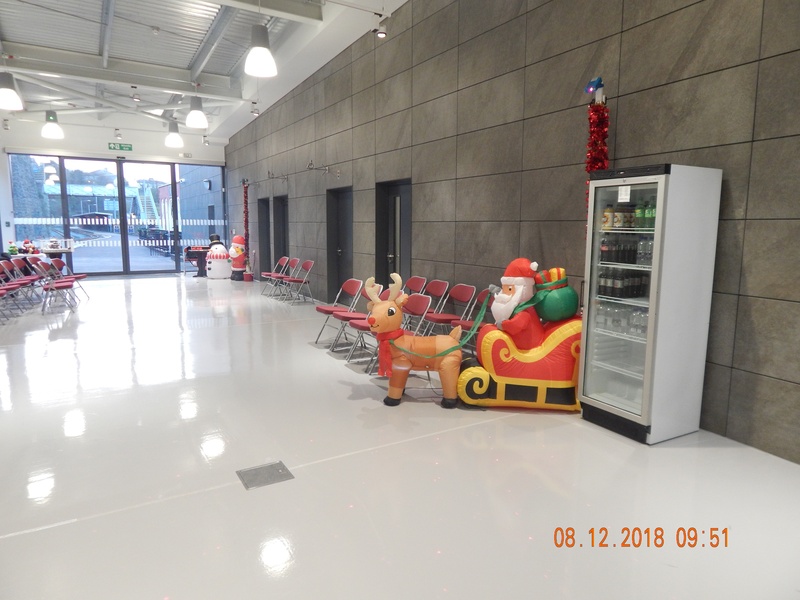 This northerly view (8/12/18) shows the Exhibition area which serves as a waiting hall for Santa Specials during inclement weather, complete displays and seating for those waiting for the train. Click on the image to enlarge and click again to see full size (where available). This image is copyright Dai Jones and was taken on a digital camera. Image post processed and displayed at 96dpi. 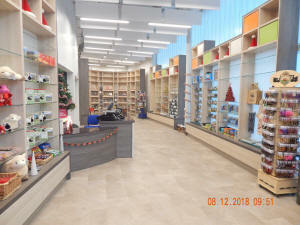 This internal view of Caernarfon station (8/12/18) shows the shop stocked with books and toys. Click on the image to enlarge and click again to see full size (where available). This image is copyright Dai Jones and was taken on a digital camera. Image post processed and displayed at 96dpi. This internal view of Caernarfon station (8/12/18) shows the entrance hall under the rotunda with an Xmas Tree welcoming the Santa Special travellers. Thought has been given to increased security after the break in at the temporary station earlier this year so a security camera has been fitted. There are still concerns about the glass panels along the front of the building though these are partly protected by bollards on the edge of the 'shared space' roundabout outside the station. Click on the image to enlarge and click again to see full size (where available). This image is copyright Dai Jones and was taken on a digital camera. Image post processed and displayed at 96dpi. The Heritage Gala over the long weekend of 21-23/6/18 has now been rebranded as WHR: 'Past Present and Future Gala. It is planned that the Gala will include Russell and other guests. It is possible Welsh Pony may be complete by then as it has been requested for the Snowdonian Limited a few days earlier on 15/6/18. Many enthusiasts also hope that one of the VoR locos will come in return for the occasional visits by Palmerston to the line. The WHR Santa Specials ran from Caernarfon to Rhyd Ddu over last weekend and No.143 was rostered to haul the train though no images have come to hand. It was a significant day in the history of the WHR. 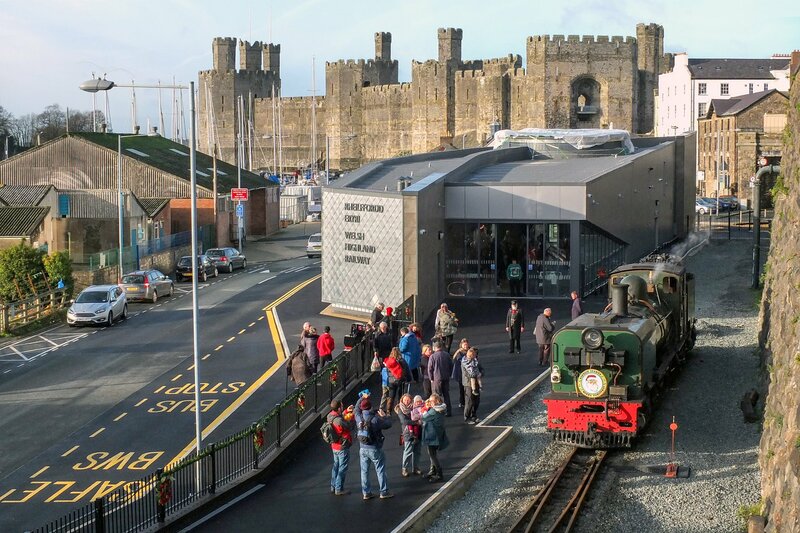 The 10.00 Santa Train departure was the first public train to leave the new Caernarfon station that was specially opened for the purpose. The Santa Trains, with eleven carriages, are the longest public trains ever to be run on the WHR. Both WHR and FR trains were double headed as a precaution about rusty rails and leaf mulch. This northerly view (9/12/18) shows No.143 with Vale of Ffestiniog in support inside departs Caernarfon at 10am. The Funkey did not seem to be doing much work so the heavy rain might have washed the rails clean. Click on the image to enlarge and click again to see full size (where available). This image is copyright Andrew Wither and was taken on a digital camera. Image post processed and displayed at 96dpi. This easterly view (9/12/18) shows No.143 with Vale of Ffestiniog in support inside passes Tryfan Junction. The front coach seems empty, possibly a staff coach. Click on the image to enlarge and click again to see full size (where available). This image is copyright Andrew Wither and was taken on a digital camera. Image post processed and displayed at 96dpi. This westerly view (9/12/18) shows No.143 with Vale of Ffestiniog passing Salem. The front coach seems empty, possibly a staff coach. Click on the image to enlarge and click again to see full size (where available). This image is copyright Andrew Wither and was taken on a digital camera. Image post processed and displayed at 96dpi. This easterly view (8/12/18) shows the first of the FR's Santa Specials from Porthmadog to Beddgelert pilotted by Taliesin double heading with David Lloyd George passing through the Aberglaslyn Pass. Taliesin was to go on the front alone on the return journey. Click on the image to enlarge and click again to see full size (where available). This image is copyright Andrew Wither and was taken on a digital camera. Image post processed and displayed at 96dpi. 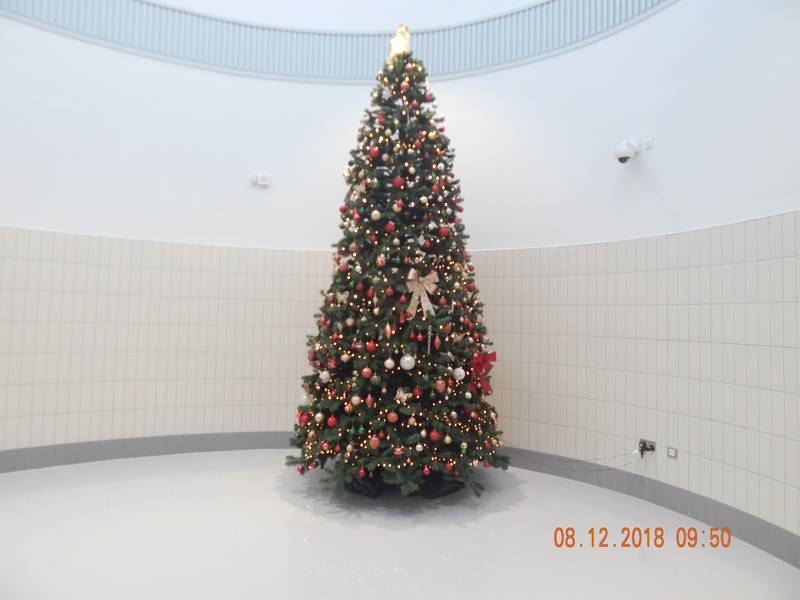 It has been announced that the station will also be open for the Xmas Mince Pie Specials 27/12/18-1/1/19 to provide a warm dry waiting area before closing for completion. The shop booking office and toilets are open but the De Winton Cafe is not yet fitted out. The station will fully open in late March for the new season and the points moved north during the WMWP and track realigned to the extended platform to allow longer trains. This will mean the Half Term Holiday trains in February run from Porthmadog to Beddgelert (MFX from 16-28/2/19). 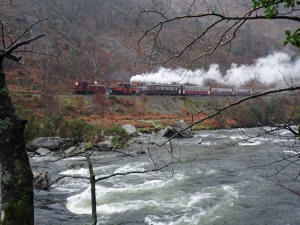 The FR Santa Special's ran to Beddgelert last weekend and ran back top and tailed by Taliesin and David Lloyd George. The train was almost full despite being early in the season. There is more availability on these trains than the Caernarfon trains since an extra carriage has also been added to these trains, requiring two locos to haul the train up the 1 in 40 to Beddgelert. The WHR Santa Specials are already sold out for the afternoon train of 16/12/18 and all four trains on the final weekend. Last year the 9-10/12/18 Santa Specials saw snow around the WHR even in the Aberglaslyn Pass creating many Xmas scenes. See Snow scenes page. This westerly view (9/12/18) shows Taliesin hauling the FR's Santa Special back to Porthmadog crossing Britannia Bridge in rather mild wet weather. Click on the image to enlarge and click again to see full size (where available). This image is copyright Keith Holland and was taken on a digital camera. Image post processed and displayed at 96dpi. 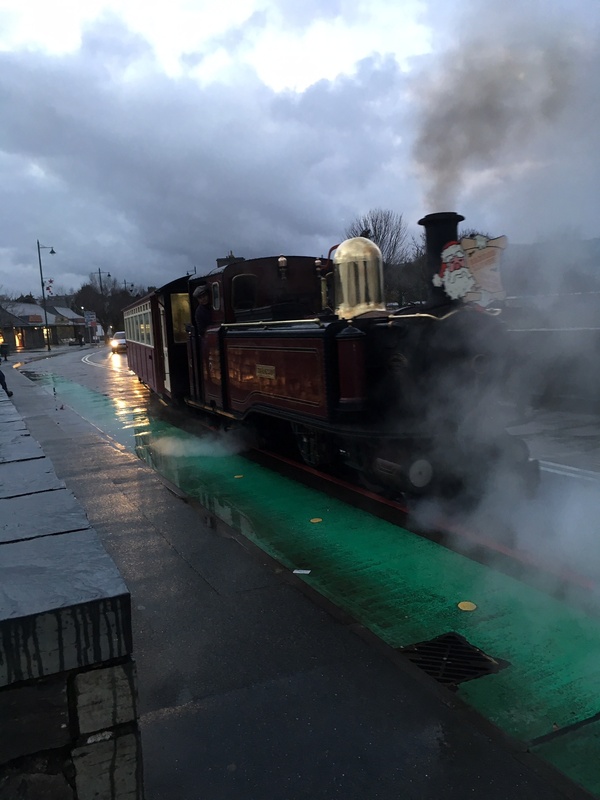 This easterly view (9/12/18) shows David Lloyd George on the rear of the FR's Santa Special back to Porthmadog crossing Britannia Bridge in rather mild wet weather. Click on the image to enlarge and click again to see full size (where available). This image is copyright Keith Holland and was taken on a digital camera. Image post processed and displayed at 96dpi. This southerly view of the Caernarfon station entrance (7/12/18) shows the station opened for Santa Specials and the Xmas Mince Pie Specials. There seems to be a plastic covering over the rotunda. Click on the image to enlarge and click again to see full size (where available). This image is copyright F&WHR and was taken on a digital camera. Image post processed and displayed at 96dpi. 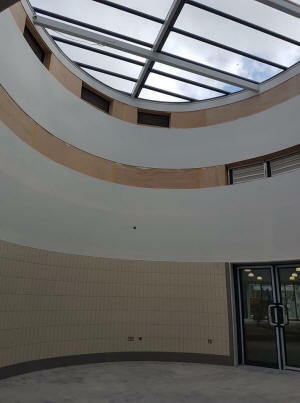 A Daily Post report celebrating the temporary opening Caernarfon station and Santa Specials also seems to show a plastic covering over the rotunda. No doubt the work to rectify this will be on the snagging list. See Daily Post story. This internal view of the Caernarfon station entrance (2/12/18) shows paper being used to soak up a leak. It seems a small amount of water has come through the rotunda. Click on the image to enlarge and click again to see full size (where available). This image is copyright Arthur Bunce and was taken on a digital camera. Image post processed and displayed at 96dpi. 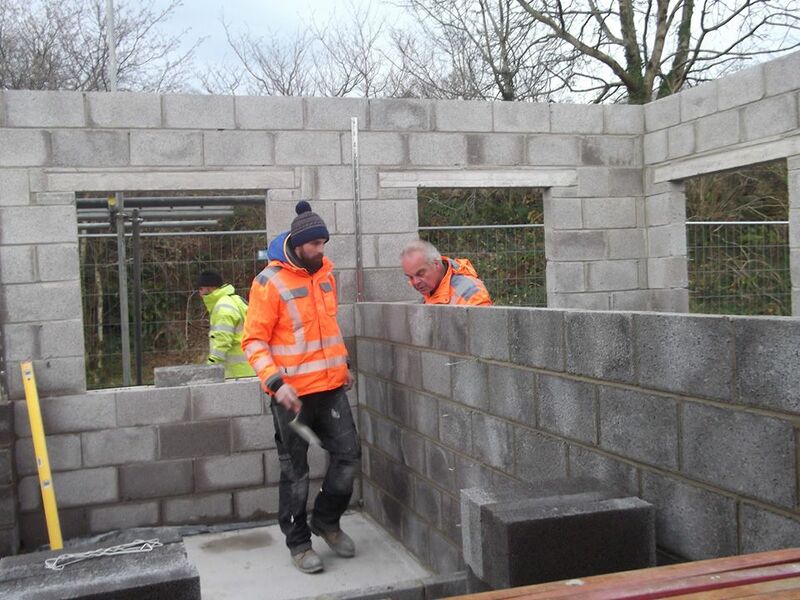 This northerly view (7/12/18) shows a week's progress with the new Waunfawr station building. The internal breeze block walls will be clad in a local stone outer layer to provide a heritage look with traditional WHR yellow brick around windows and doors. It is possible the small stones original stones saved on pallets under the footbridge will be reused. access is via the formed yard behind the station building. Click on the image to enlarge and click again to see full size (where available). This image is copyright Stuart McNair (F&WHR) and was taken on a digital camera. Image post processed and displayed at 96dpi. Fence lines will appear soon and the new A487 which passes south of Caernarfon and west of Bontnewydd. The new alignment crosses the WHR by means of a bridge just north of Bontnewydd Halt. David Gander reports: Our final meeting of 2018 will be held this Thursday 13/12/18 and will be our traditional ‘Mince Pies and Members’ Slides’ event where we welcome contributions from visitors. If you have any of your own pictures or film you would like to show, please bring them along on disk or USB stick. We take a break in January and will then meet again in February 2019. We meet at the Six Bells Pub, 9 High Street, Fulbourn, Cambridge CB21 5DH. We meet up any time after 6-6.30pm and an evening meal is available in the restaurant or bar. Prices are reasonable. The meetings are usually held in the Function Rooms, accessed from the car park at the rear of the pub, and start around 8pm with a halfway break for coffee (£1.20 per person). We finish around 10pm. You are most welcome to join us. We meet on the third Thursday of the month (excepting December when it’s the second Thursday), with meetings held until May – with a break in January. 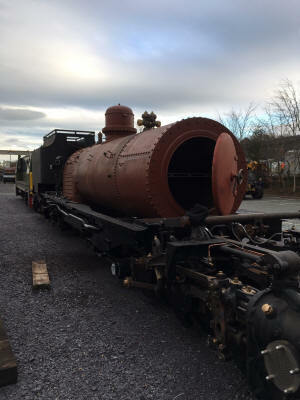 By 5/12/18 No.130's boiler cradle was having its final coat of paint in anticipation of the boiler arriving on Wednesday 12/12/18. No.130's boiler was finished by 7/12/18 and has departed the works of Northern Steam Engineering, Stockton, and is on its way to Wales Many thanks to Adam Dalgleish and his team in completing this challenging task. It may be a bit behind schedule but it looks like a superb job has been done. When it arrives at Dinas it will be craned into the frames this week. The return load will be No.134's boiler. By 9/12/18 No.130's new cab was nearing completion. Window frames are being added as well all of the other detailed features. The whole cab will then be shot blasted to remove all of the rough edges and mill scale before a first primer is applied. It is planned to lift the boiler onto the cradle on 12/12/18. There has been some progress with plans for the Heritage Gala weekend 21-23/6/19. The weekend will feature a varied timetable of historic trains, including locomotives and carriages that worked on the railway prior to its closure in 1937, including Hunslet 2-6-2T Russell, the sole surviving locomotive built for the original PBSSR. 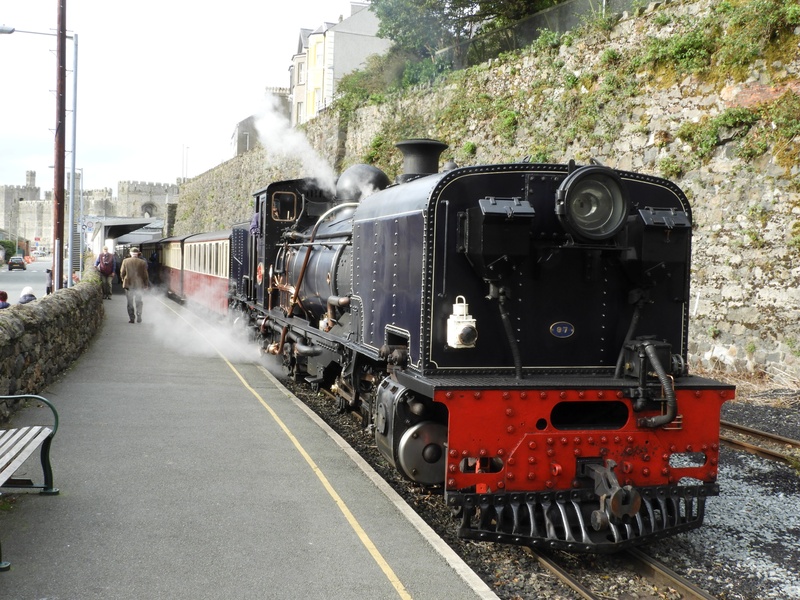 Planning for the event is still at an early stage, but it is intended that heritage trains will be running in the section of line between Minffordd, Porthmadog and Beddgelert, during the intervals between regular passenger trains. 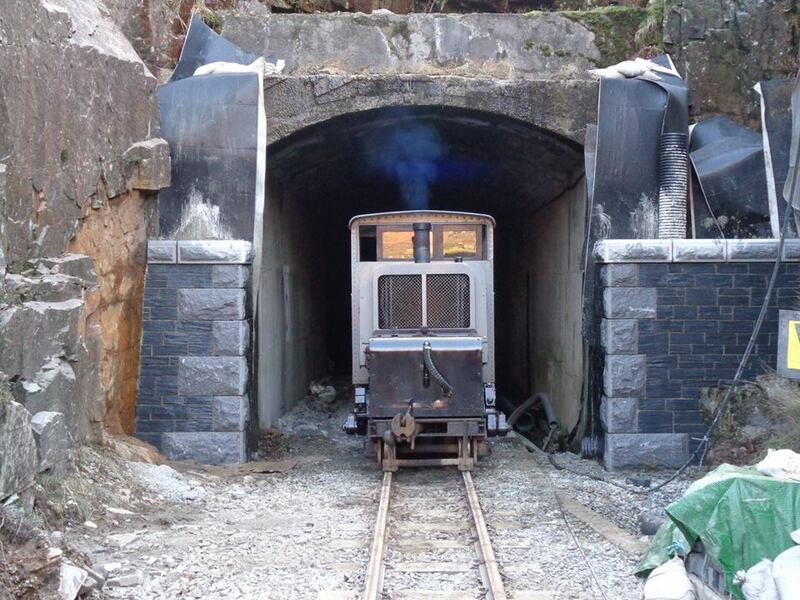 This will provide an opportunity to experience the development of narrow-gauge railways over the past century. Welsh Pony may also be available, if completed in time, as it has already been announced that it has been requested for the Snowdonian Limited a few weeks later on 15/6/19. With only two trains per day rather than three last year, demand has been high for the available places on WHR Santa Specials. The trains had been made longer than previous years to provide a similar number of seats. However, demand has been such that an extra coach needs to be added to WHR trains that run from Caernarfon to Rhyd Ddu. Some trains are already fully booked. Weather is cooling down over the weekend from the recent mild spell to more typical December weather with snow on Snowdon. See F&WHR Santa page for full details. Panoramic TfW coaches for North Wales? TfW is to examine the possibility of panoramic coaches for North Wales to attract tourists to the delights of Snowdonia. Already lower density seating has been ordered with seats matching window spacing. This further step might include glass sections in the roof as used on Swiss scenic railways. The wooden 'beehive' service equipment boxes on the platform at Porthmadog have been replaced by grey metal cabinets which may be more durable and protect the service equipment better. Every year a privately hired short Santa Special is run and normally goes to Tan-y-bwlch on the FR. This year the special ran to Beddgelert with Blanche in charge of the 3 coach train, which included the Observation Car No.152. The loco struggled in places on the 1 in 40 which had not been used for a few weeks so the railhead may have been rusty or covered in leaf mulch. 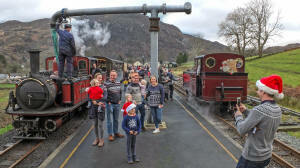 This may have led to the decision to double head the FR's Beddgelert Santa Specials. 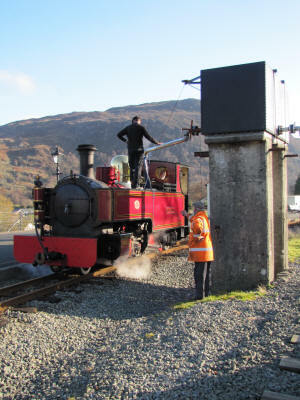 The loco watered at the historic water tank at Beddgelert rather than the main water crane at the north end of the platform. 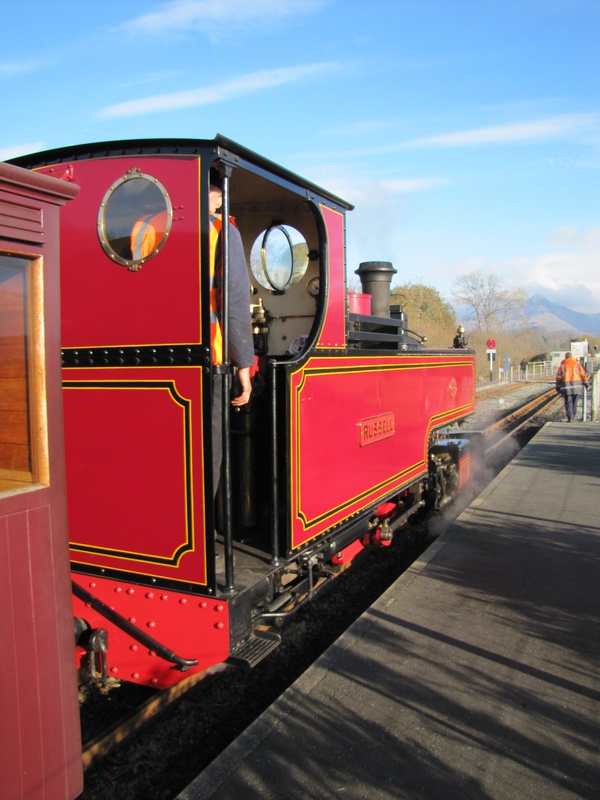 The AGM of the Blaenau Ffestiniog and Trawsfynydd Railway Society will take place on 3/2/19 in Cell B Cafe Bar Blaenau Ffestiniog at 2pm for accredited members. The new organisers of the Trawsfynydd Branch restoration project hope to relaunch the project with a new committee under the name Bala & Ffestiniog Railway Heritage Trust. Those interested may read the AGM notice at the organisation's Facebook website. After a cold snap Thursday/Friday, temperatures are set to rise again for the weekend of 15-16/12/18 which will see 2 daily Santa trains at both ends of the line to Rhyd Ddu and Beddgelert. While snow is forecast on the summit of Snowdon, no snow is forecast around the WHR. With trains operating from Porthmadog to Beddgelert during the February school holidays (MFX from 16-28/2/19) and Porthmadog-Beddgelert weekend trips from 25/2/12, here are some useful resources to check if there is snow at the WHR. First Hydro had four webcams in the Llanberis valley. These have been discontinued due to maintenance problems. An alternative webcam can be viewed at Snowdon webcam website. However, it should be noted that snow cover generally decreases from east to west. Other useful resources include the A55 webcams (pages 7-13). The Treborth Interchange (Bangor) webcam can be helpful though it is nearer sea level than the WHR and also shows live traffic conditions if using this route to reach the WHR. The main Meteorological Office website also has a Snowdon Ranger page that shows the predicted weather for the Rhyd Ddu area for the next seven days. On 3/12/18 an order was signed by the F&WHR to equip the WHR with micro-ETS. The system which uses a secure internet connection, has been in trial use between Pont Croesor and Beddgelert and avoids the use of lineside cabling which is subject to disruption in adverse weather conditions and potential theft. The system will use the redundant ETS equipment bought from Irish Railways several years ago. It is hoped that installation of the system will bring improved safety and operational flexibility to the WHR. The system has been developed with provision for the new starter signals being installed along the WHR. Micro-ETS was developed by Roland Doyle, ex- Manager of WHR Construction Ltd. under the brand name HighRail. For full details on the Micro-ETS system see Roland Doyle's article on the WHR Society website. The restoration of Kerr Stuart No.4415, the experimental diesel shunter that spent time on the WHR in 1928/9, saw more progress during the Autumn. Volunteers were all kept busy over the ever popular Victorian Weekend (5-7/10/18), but they managed to squeeze in a bit of work on KS4415 in too. More fabrication of parts for the gearbox frame was carried out and the broken crankshaft from the McLaren engine has been boxed up and sent off. The crank is going to Farndon Racing in Coventry, who are going to measure it up and make a new one. This marks a big step forward for the MDB4 rebuild project and hopefully by the time the new crank arrives the Group will be able to turn their full attention to the engine. Until then there are a few jobs left to do on the chassis. Hopefully KS4415 will take a starring role in Heritage Galas/Victorian Weekends in the future. On 21/10/18 the big piece of steel cut to make a new plate for the clutch and gearbox bearer to rest on was being worked on. The original was too wasted to be reused and it had been modified at some point. This weekend volunteers machined the steel accurately to size, drilled and riveted a piece of angle to it, and managed to get a coat of paint on everything. The area under where the plate fixes was also cleaned and painted and these jobs get the Group a step closer to refitting the gearbox. On 3/11/18 volunteers were at Boston Lodge focusing on fabricating the new gearbox frame. The blocks they had machined and drilled a few weeks ago were welded in place and the assemblies were cleaned up and painted. The side that clamps over the layshaft was a good fit, but the other side has to sit over a tapered cast iron bearing. Due to the taper it was difficult to measure and know exactly how far up the taper the clamp would sit. Once it was offered up volunteers realised the hole would need to be opened out, so they did that on the horizontal borer. Other work carried out included painting the couplings and refitting the front one so it is in before they install the gearbox. The KS4415 Group like to thank the Ffestiniog Railway Society Bristol Area Group for their generous donation of £1000 towards the project. Details of how to donate can be found by following this link. 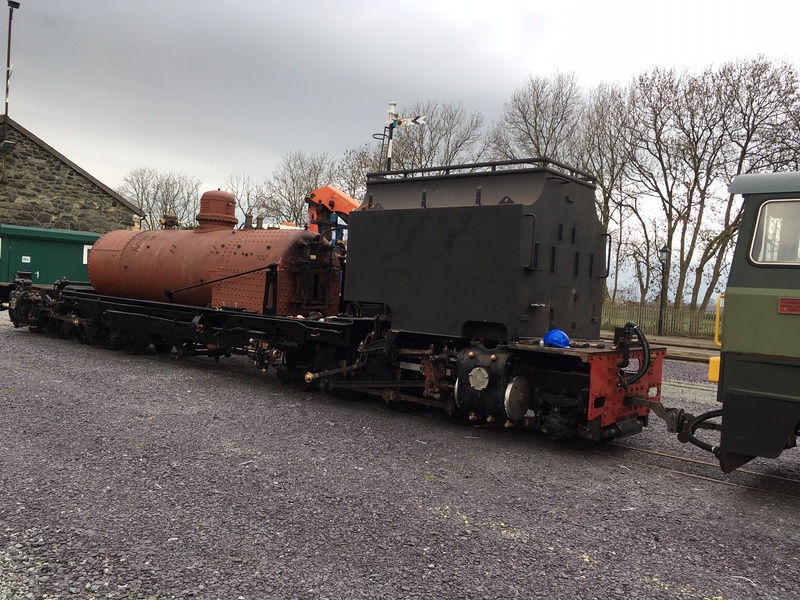 On 25/11/18 the chassis was dragged out into the open again at Boston Lodge by works shunter Moel y Guest. Work taking place over that weekend saw an attempt at fitting the gearbox back in the frames. As should be expected, there were a number of issues that came up and, despite making some good progress towards sorting everything out, volunteers decided to leave the gearbox out and make a modification to the frame at our next working party. It will be a long job, abut they do not want to rush it o r cut corners. See picture captions for more details on KS4415 Facebook page. Further details of progress and images are also available on the KS4415 Blogspot. WHR Santa Specials run over the next three weekends 8-9/12/18, 15-16/12/18 and 22-23/12/18. Trains leave Caernarfon at 1000 and 1340 and run to Rhyd Ddu. There are only two trains a day this year but they are record length trains with 11 coaches providing about the same number of seats as last year's three daily trains. This allows staff to have a lunch break. It is possible trains will run in the snow as last year. However the weather has warmed since the November cold snap. 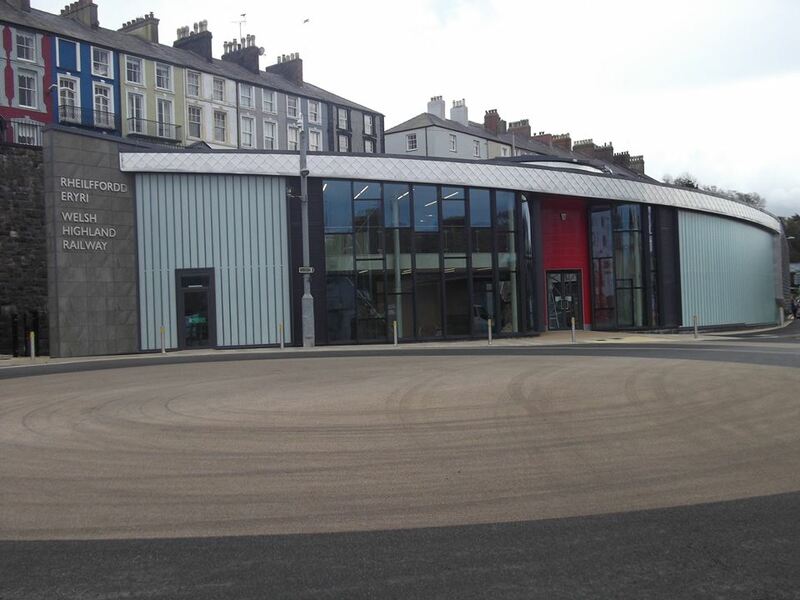 Passengers are to be greeted at the new Caernarfon station building, in use for the first time. FR Santa Specials run Porthmadog to Beddgelert at 1100 and 1415. See F&WHR website for details. With warmer weather forecast until the weekend, only the mountain tops are forecast to receive fresh snow on Friday 7/12/18-Sunday 9/12/18 for the first Santa weekend. At Dinas, the hard work of plumbing up the lubrication system is well advanced. The copper and flexible pipework to connect up the system is being fitted and eventually primed with oil. One engine is about 75% complete whilst the other is just 50%. For images see No.130 Facebook page. TfW inherited a fleet of trains that have been very poorly maintained, which we did not have full and proper access to ahead of inheriting them, and that, along with Storm Callum, and taking over the franchise in the autumn period, presented huge challenges for Transport for Wales and the operator and the delivery partner Keolis/Amey. TfW fleet is not fitted with wheelslide equipment and Sandite has not been applied to rails since 2016 across the UK. Many DMUs have developed wheelflats as a result of adverse weather conditions. Damage to some units from storm Callum during the Autumn has compounded the problem. 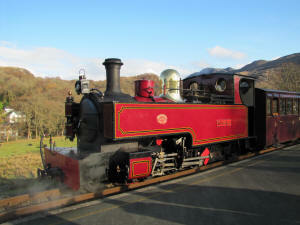 Mark Herbert of the WHHR has published a YouTube of Russell's test run to Beddgelert on 25/11/18. Click on the YouTube link to watch 21 mins and 42 seconds of video published 27/11/18. Recent working parties have been doing a substantial amount of work on the boiler and its associated components and fittings. This has included the cleaning out of the foundation ring, removal of handrail brackets, painting the outside of the boiler as well as refurbishment of components such as the main steam pipe, chimney etc. This work was to prepare the boiler ready for it to be sent away for overhaul, a landmark day for the project as this is the largest item for the loco and one that was still needing attention. Most of the effort spend on November's working party was also directed towards the boiler and its components. The first job was the superheater header. Volunteers had cleaned and painted this last time and so this weekend (17-18/11/18) the team re-cut and lapped in the seating for the ends of the superheater tubes. Other boiler components worked on included the regulator stuffing box and gland. Both were cleaned and in the case of the stuffing box, also painted. The J-pipe also saw attention as this was still in situ in the boiler. This was duly removed and cleaned and also measured for the thickness of the casting. It is not unusual to see wear on the inside of the bend in the pipe and this was the case here with it down to a thickness of around 55% compared to the rest of the casting. Whilst the ultra-sonic thickness tester was to hand volunteers were also asked to measure the smokebox thickness as part of the Group's understanding of what the level of work would be needed on it. Several of the team also cleared access to the boiler itself by moving/removing the various railway orientated bits and pieces that had accumulated round it over the years - as has been seen in the various photos of the boiler over the last few months. This is now clear to give unhindered access to the boiler by the vehicle that will come to collect it. See NG15 website for images. TRAWS, the campaign to reconnect North and South Wales railways via the Cambrian Coast, reports that Aberystwyth Town Council has reaffirmed its support for the Aberystwyth-Carmarthen reopening, recently subject to a feasibility report. The scheme will require a new tunnelled approach to Aberystwyth that joins the existing Cambrian Coast line near Llanbadarn after crossing the VoR. The Bala & Ffestiniog Railway Heritage Trust, which is taking over the former BF&TR project, may bid for the 'Festiniog Station Signal Cabin' sign which is up for postal auction. 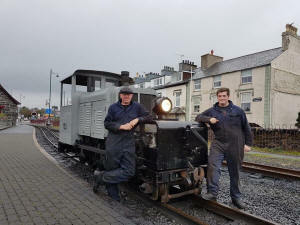 Members of the Welsh Highland Heritage Railway in Porthmadog, working with colleagues from the F&WHR Highland Railway are pleased to announce the only surviving WHR steam locomotive, Russell built by the Hunslet Engine Company in 1906 will be running on a section of the original Welsh Highland Railway in 2019! 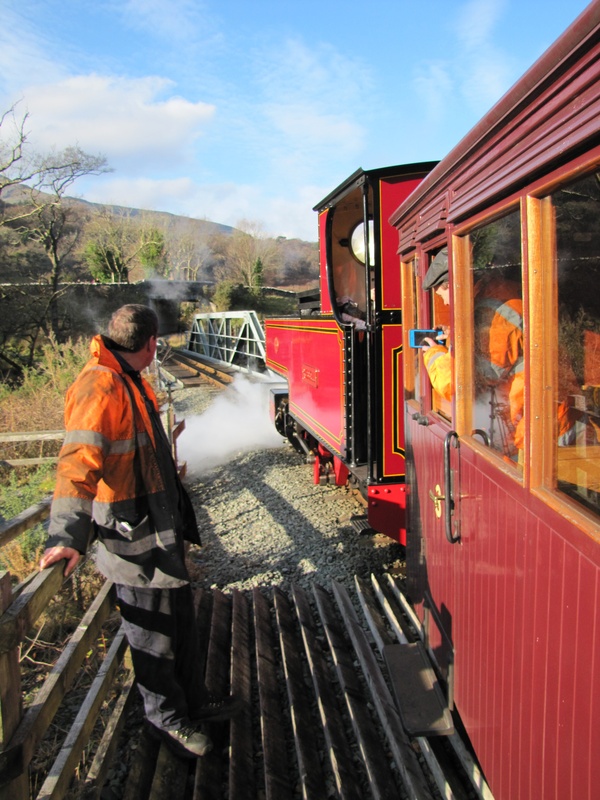 Russell successfully completed a gauging and inspection run on the 25/11/18 along part of the original line of the Welsh Highland Railway. This represents the first time the locomotive has travelled along this section since 1937, when it was on its way to Dinas to be locked away at the closing of the line. This northerly view (25/11/18) shows the WHR(P)'s Russell taking the crossover at Pen-y-Mount before heading to Beddgelert. This is the first stage in the preparation of the locomotive for its possible participation in a Heritage Weekend involving the two railways in June 2019. Click on the image to enlarge and click again to see full size (where available). This image is copyright Michael Chapman (WHR(P)) and was taken on a digital camera. Image post processed and displayed at 96dpi. The run was made possible owing to the close working relationship between the two railways in preparation for Russell to appear at a special event in 2019 to celebrate the heritage of the Welsh Highland Railway. 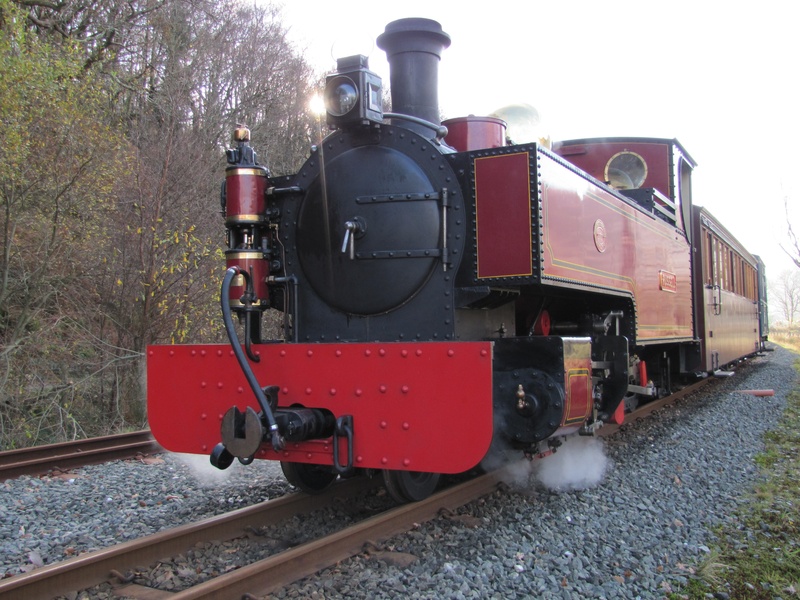 As part of the Welsh Highland Heritage Weekend between Friday 21-23/6/19 Russell will be working between the replica 1920s WHR halt at Pen-y-Mount, to Pont Croesor and on to Hafod-y-Llyn. Russell ran on another section of the line in 2000 when it ran from Caernarfon to Waunfawr. This will be the first opportunity for it to stretch its legs with a longer run since it was restored in 2014 to as close as possible the condition as-built in 1906, at a cost of over £350,000 all covered by private donations. This northerly view (25/11/18) shows the WHR(P)'s Russell arriving at Pont Croesor. Click on the image to enlarge and click again to see full size (where available). This image is copyright Michael Chapman (WHR(P)) and was taken on a digital camera. Image post processed and displayed at 96dpi. This southerly view (25/11/18) shows the WHR(P)'s Russell arriving at Hafod-y-llyn hauling WHR stock. Initially, this seems to be the proposed limit of Russell's running in the event Heritage Weekend Gala 21-23/6/19. Click on the image to enlarge and click again to see full size (where available). This image is copyright Michael Chapman (WHR(P)) and was taken on a digital camera. Image post processed and displayed at 96dpi. This northerly view (25/11/18) shows the WHR(P)'s Russell threading the tunnel's in the Aberglaslyn Pass. Click on the image to enlarge and click again to see full size (where available). This image is copyright Michael Chapman (WHR(P)) and was taken on a digital camera. Image post processed and displayed at 96dpi. This northerly view (25/11/18) shows the WHR(P)'s Russell making slow run-pasts on the tight curves at Bryn-y-felin, while being inspected by staff, to see if the pony trucks performed acceptably. Click on the image to enlarge and click again to see full size (where available). This image is copyright Michael Chapman (WHR(P)) and was taken on a digital camera. Image post processed and displayed at 96dpi. 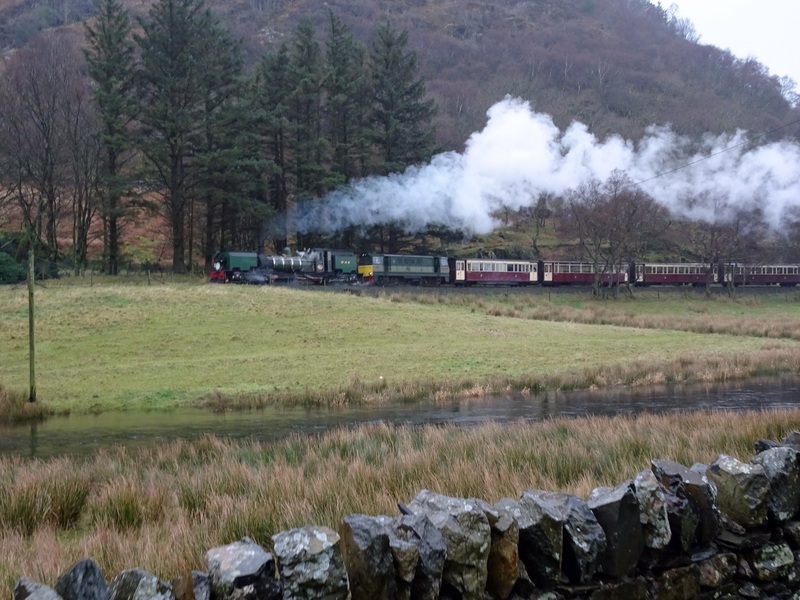 This southerly view (25/11/18) shows the WHR(P)'s Russell arrived at Beddgelert. Click on the image to enlarge and click again to see full size (where available). This image is copyright Michael Chapman (WHR(P)) and was taken on a digital camera. Image post processed and displayed at 96dpi. This northerly view (25/11/18) shows the WHR(P)'s Russell at Beddgelert with the test team including members of the WHHR and the F&WHR's engineering departments. Click on the image to enlarge and click again to see full size (where available). This image is copyright Michael Chapman (WHR(P)) and was taken on a digital camera. Image post processed and displayed at 96dpi. This southerly view (25/11/18) shows the WHR(P)'s Russell watering at the original WHR water tank that Russell will have used in the 1930s. Click on the image to enlarge and click again to see full size (where available). This image is copyright Michael Chapman (WHR(P)) and was taken on a digital camera. Image post processed and displayed at 96dpi. This southerly view (25/11/18) shows the WHR(P)'s Russell returning to Beddgelert Farm depot, pausing at Pont Croesor loop. Click on the image to enlarge and click again to see full size (where available). This image is copyright Michael Chapman (WHR(P)) and was taken on a digital camera. Image post processed and displayed at 96dpi. See Michael Chapman's Flickr page for more images. On 27/11/18 at 11am the F&WHR released a Press Statement that duplicated the WHHR's statement. 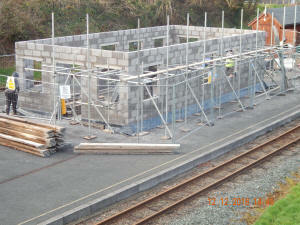 This northerly view (26/11/18) shows a week's progress with the new Waunfawr station building. The internal breeze block walls will be clad in a local stone outer layer to provide a heritage look whilst giving a smooth inner surface. Click on the image to enlarge and click again to see full size (where available). This image is copyright Stuart McNair (F&WHR) and was taken on a digital camera. Image post processed and displayed at 96dpi. This easterly view (25/11/18) shows the WHR(P)'s Russell arriving at Beddgelert hauling WHR stock, including NWNGR coach No.9 and the ex-VoR BR re-liveried brake van No.M135, for the first time since the railway closed on 5/9/1936. 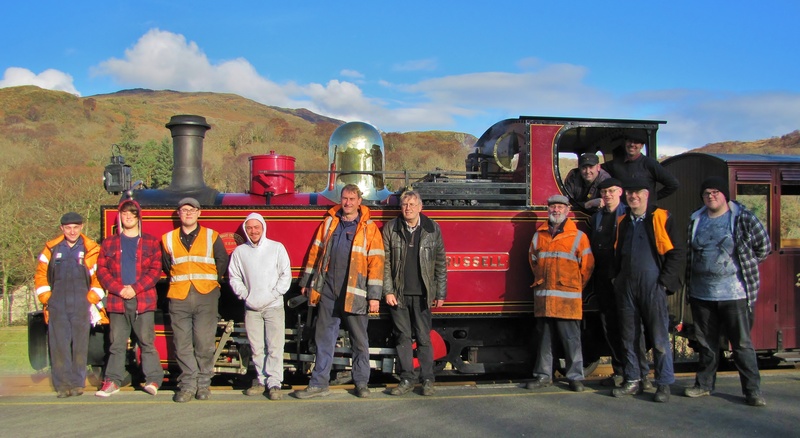 This secretive run successfully completed a gauging and inspection test on the WHR to Beddgelert, under the auspices of WHHR and Ff&WHR engineering and operating staff. 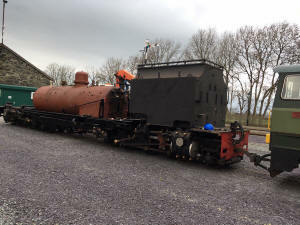 This is the first stage in the preparation of the locomotive for its possible participation in a Heritage Weekend involving the two railways in June 2019. Click on the image to enlarge and click again to see full size (where available). This image is copyright Michael Chapman (WHR(P)) and was taken on a digital camera. Image post processed and displayed at 96dpi. After the disappointment of the Hunslet Gala, when Russell did not appear, there is great news on the Russell front. Should negotiations reach a successful conclusion Russell will hopefully appear at the new Heritage Gala event 21-23/6/19. Many enthusiasts have waited over 20 years for this event and it is sure to draw huge crowds. Click on the YouTube link to watch 2 mins 27 seconds of drone coverage video showing the WHR(P)'s Russell's test run to Beddgelert. This YouTube was published on 25/11/18 and was taken by Will Stratford using a drone camera. It is best watched in 2160p 4K HD in Google Chrome browser as only 720p HD available on Windows. Alternatively, View on YouTube where all options are available. Snow reports will begin from 1/12/18. Snow is forecast for Rhyd Ddu on 27/11/18 if there are any PW workings about. Last year there was snow on some Santa Special days at Rhyd Ddu in December. However, weather is warming again later in the week. Today is the final day of Prince workings from Porthmadog to Hafod-y-llyn WThSO. There may be snow on the mountains given the recent cold snap. Spooners is offering Winter Warmer comfort food. 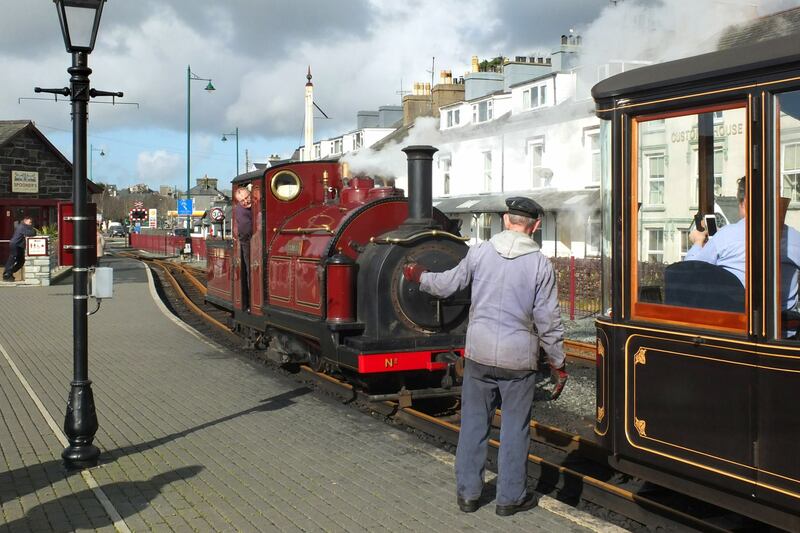 Trains depart Porthmadog at 1115 and 1405. This westerly view (21/11/18) shows Prince backing onto a Hafod-y-llyn working in Porthmadog Harbour station. Click on the image to enlarge and click again to see full size (where available). This image is copyright F&WHR and was taken on a digital camera. Image post processed and displayed at 96dpi. This northerly view (21/11/18) shows Prince hauling a Hafod-y-llyn working departing Porthmadog. Click on the image to enlarge and click again to see full size (where available). This image is copyright F&WHR and was taken on a digital camera. Image post processed and displayed at 96dpi. 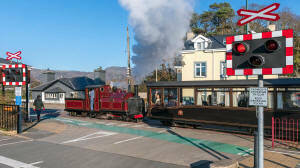 The F&WHR is offering £15 off The 40 mile Railway and Fairlie Locomotives. The offer is available in shop or on line and at Warley Exhibition this weekend with prices reduced to £15 and £24.95 respectively. 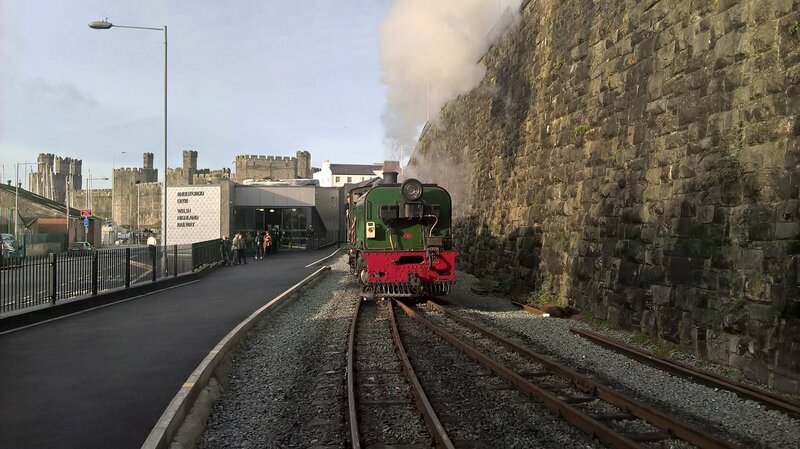 The Caernarfon booking office/shop will be open from Thursday-Saturday 1000-1600 on the lead up to Xmas for purchase of Santa special tickets etc. 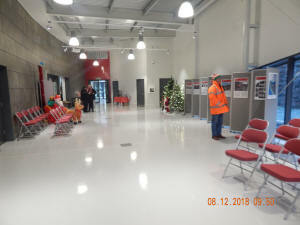 The Santa Special passengers will be able to use the new Caernarfon station building. There have been many complaints about Transport for Wales service reductions caused by wheel flats etc. this Autumn. Some jokers have rearranged the TfW acronym into a less than complimentary version of the initials. The Conwy Valley service has been bustituted with a slow bus service and no trains have operated for over a week and may not return until January. Wrexham-Bidston Borderland services appear to have been cancelled from Monday and the MANWAG may not appear next week either. Some services have been combined together and now, possibly for the first time, there is a Holyhead-Aberystwyth/Pwllheli service, via Birmingham International! The obvious solution to hire in loco hauled stock does not seem to have filtered through to the management levels of TfW. It will be some time before the new Class 230 is available as they have only just started test running on the Bedford-Bletchley service. TfW has apologised and has stated over 25% of its trains out of service. See Daily Post report. Work will start within weeks on the A487 Caernarfon-Bontnewydd Bypass that runs from the end of the Y Felinheli Bypass at Plas Menai east of Caernarfon to the Goat Roundabout south of Dinas at Llanwnda. The route will cross the WHR just north of Bontnewydd Halt by means of a bridge and is an alternating side 3 lane road with intermediate roundabouts. The £135m 6 mile scheme will be opened by Spring 2021. Sadly there is no junction with the A4085 Beddgelert Road. See Daily Post report. 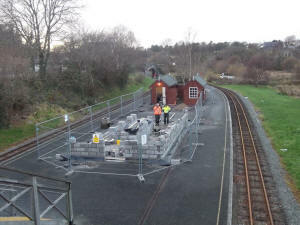 This northerly view (19/11/18) shows the start of work on the new Waunfawr station building, now fenced off with Heras fencing. The temporary wooden buildings are visible in the background. Click on the image to enlarge and click again to see full size (where available). This image is copyright Stuart McNair (F&WHR) and was taken on a digital camera. Image post processed and displayed at 96dpi. 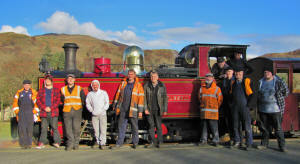 The successor organisation to the BF&TR, seeking to reopen the Blaenau Ffestiniog to Trawsfynydd Lake Halt branch, has published details of its forthcoming AGM now that the accounts of the previous support group have been sorted out. Network Rail asked the previous organisation to stop working on the project at the end of last year when it became clear work was not being done in accordance with the terms of the licence. Essex businessman Colin Dale, the previous promoter of the project, died in July. The new group's AGM will be on Sunday 3/2/19 at 2pm with notices to be sent out to members in January. The Steering Committee proposes to launch the new organisation as a Trust and has secured the original Bala & Festiniog Railway seal to use as part of its logo. The eventual depot could be at Maentwrog Road or Trawsfynydd Lake, where the nuclear waste transhipment siding lies. The group has also constructed a new website where those interested can join the group. The group has been made aware of trespass on the railway and, even though the line is disconnected at Blaenau Ffestiniog, reminds visitors that they should keep outside the boundary fence as it is still and offence to walk the route. Some sections near the summit of the Cwm Prysor Pass are however a public footpath. See BF&TR Facebook page. Good progress has been made during the Winter Major Works Programme at Boston Lodge. 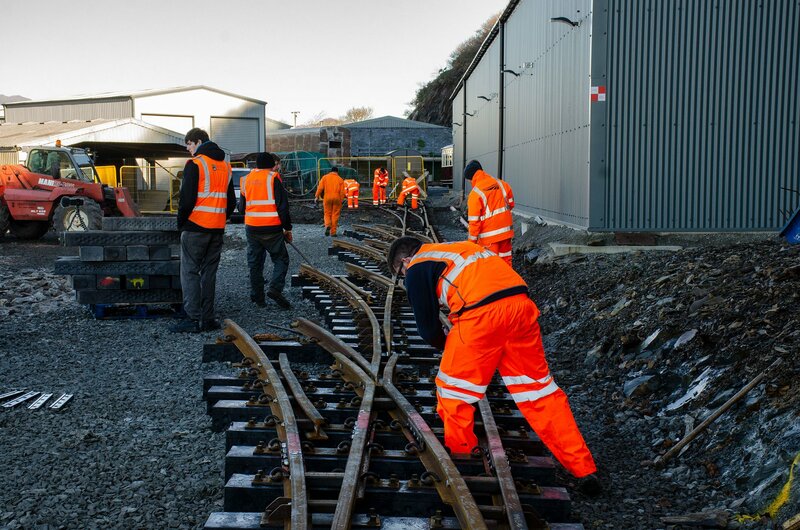 The Young Rail Professionals Group has been volunteering with the tracklaying of new points and plastic sleepers near the headshunt at the south end of Boston Lodge Carriage Shed. Some work was necessary to break out the rails from the concrete at the end of the existing Carriage Shed to align them with the new pointwork. This northerly view (17/11/18) shows volunteers from the Young Rail Professionals Group laying points alongside the Heritage Carriage Shed. Two new points are included in the relay of six turnouts which will presumably give access to the new Carriage Shed to be constructed on the seaward side of the existing Carriage Shed on the left of this view. Click on the image to enlarge and click again to see full size (where available). This image is copyright F&WHR and was taken on a digital camera. Image post processed and displayed at 96dpi. 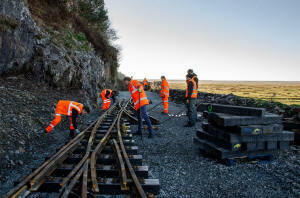 This southerly view (17/11/18) shows volunteers from the Young Rail Professionals Group laying points near the southern headshunt at Glan-y-mor. Two new points seen will presumably give access to the new Carriage Shed to be constructed on the seaward side of the existing Carriage Shed on the right of this view. There should be enough room in the headshunt for a Garratt loco. Click on the image to enlarge and click again to see full size (where available). This image is copyright F&WHR and was taken on a digital camera. Image post processed and displayed at 96dpi. Santa Specials are to run on the WHR from Porthmadog to Beddgelert and Caernarfon to Rhyd Ddu this December. The dates are 7-8/12/18, 14-15/12/18 and 22-23/12/15. The increasing success of the Caernarfon train has meant that for the second year trains are extended to Rhyd Ddu to allow more time for Santa to visit children on the train. Two trains will run at 1000 and 1340. 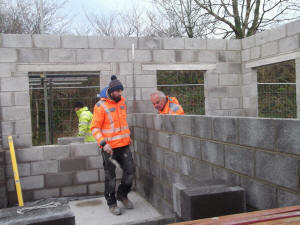 In addition work may have started on the new Waunfawr station building in December. The Porthmadog workings are at 1100 and 1415. See F&WHR website for full details. Last year there were snowy scenes on some Santa specials with snow down to low levels and it is possible the six days of operation will again overlap with cold snowy weather this year. TfW has had to cancel 20% of trains due to so many DMUs being damaged by wheel slip. Trains have also been short-formed. Rail Head Treatment Trains have been running but the weather conditions and leaf fall seems to have overwhelmed this protective measure. One in five Transport for Wales trains is damaged by leaves on the track and out of service. See Wales Online website. By 14/11/18 the new cab was over 50% complete at Dinas. The carrier plates for the wooden roof have been fixed and the wood purchased. Shortly the new window units will be trial fitted. Most of these have the glass fitted now. By 19/11/18 WHR staff had constructed a dual purpose box to house the speedometer and to fit the lighting controls. No.130 will have a front and back LED light, plus a cab light, all driven from a battery. The control box will make the lighting controls very easy for the crews to use. On 21/11/18 the second trial steaming of the boiler was held in advance of the formal out of frames steam test on 23/11/18. All went very well and the boiler was taken up to blowing off point several times. There were minimal weeps and the regulator works well. On 23/11/18 the boiler passed its out of frame steam test witnessed by the inspector from British Engineering. By 24/11/18 the header brackets had been made, drilled and bolted in position. The brackets will be riveted in position on Monday 3/12/18. Then the header can be permanently fitted using the brass ring. Finally, the elements will be fitted to complete the steam circuit. For images, see No.130 Facebook page. A new development for 2019 is the staging of a 'WHR Heritage Weekend' over 3 days (Friday-Sunday) in June next year. No details are to hand yet but enthusiasts hope that historic locos and trains that operated on the WHR will be made available, including possibly F&WHR's own Prince, Palmerston, Taliesin and a static Princess. Welsh Pony might be available if completed in time. 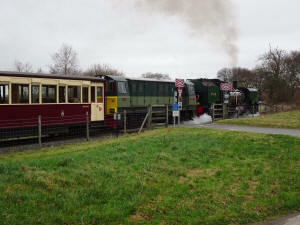 Visiting locos could include Russell (from the WHHR) and Baldwin No.778 (possibly running as WHR No.590) from the Leighton Buzzard Light Railway. 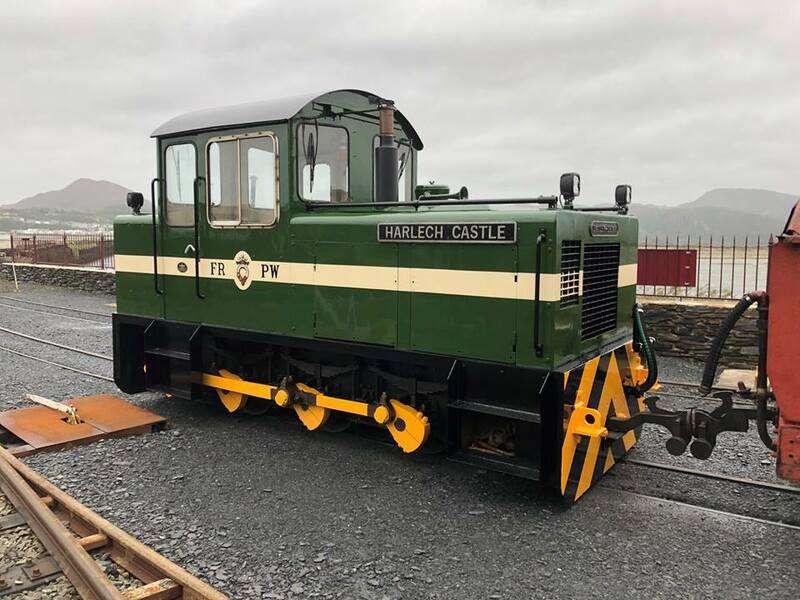 The F&WHR management has been encouraged by the success of the Heritage trains run in August to Tryfan Junction and Rhyd Ddu, which will operate again in August 2019. Next year's The Snowdonian will run between Porthmadog-Blaenau Ffestiniog and Caernarfon with Lyd and Lyn (from L&BR) double heading on the WHR. The £200 cost includes breakfast, lunch and afternoon tea and a Friday evening visit to Boston Lodge Works. 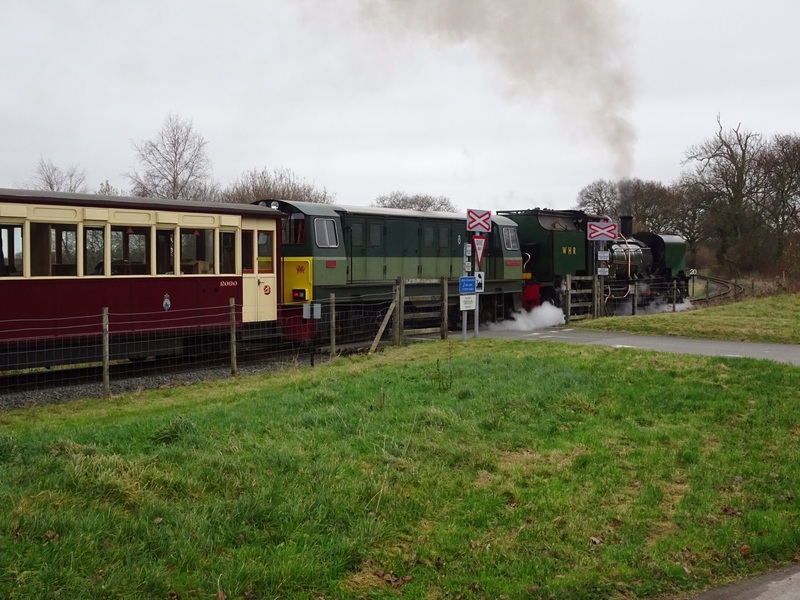 The Snowdonian Limited will run on 15/6/19. This train will run non-stop on the WHR, Garratt hauled from Boston Lodge and Welsh Pony has been requested if completed in time on the FR section. Bookings are open and First Class is already sold out. See Snowdonian website to book. No.134's boiler is being prepared for departure to be refurbished in December. 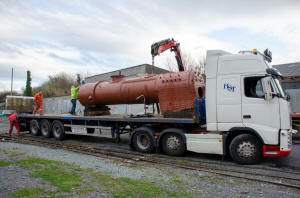 It will travel on the same outbound lorry that will be returning NG16 No.130's new boiler. The bottom end of the loco is not far off complete after many volunteer monthly work parties over the years. The tender frame needs a new front drag box but the bogies and braking are almost complete. A new tank/bunker are sitting on No.133's tender chassis which only fit for moving it around slowly. It should not take long to pull it all together when the boiler returns. It is hoped the boiler work will reinvigorate the monthly work parties and the rest of the loco will be ready to accept the boiler when it returns. See NG15 No.134 Facebook page. Working Party dates are 17-18/11/18, 8-9/12/18, 19-20/1/19, 16-17/2/19 and 16-17/3/19. Click on the YouTube link to watch 29 mins 13 seconds of video covering end of season Autumn Gold scenes, Halloween trains and a dedication ceremony for the new War Memorial at Tan-y-bwlch to remember those F&WHR employees who lost their lives serving for their country in wars. This YouTube was published on 12/11/18 and was taken by John Wooden (F&WHR) on a professional 4K camcorder. It is best watched in 2160p 4K HD in Google Chrome browser as only 720p HD available on Windows. Alternatively, View on YouTube where all options are available. The Transport for Wales fleet run by KeolisAmey, is slowly acquiring its new livery with internal upgrades and new external bilingual Envision print wrap etc. The £40 million investment will see the existing fleet being finished in the new TfW livery, both internally and externally. It will take 12 months to complete the fleet. Work is taking place at Alsthom's Chester depot to upgrade the fleet of 127 DMUs. The weekend makeover takes place at the same times as programmed maintenance to minimise disruption to services. 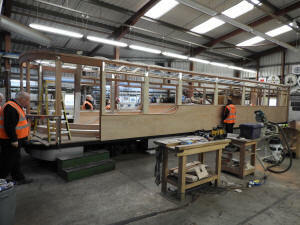 See North Wales Chronicle report which includes a time lapse sequence of a train being refurbished. On 10/11/18 the new boiler for No.130 passed its cold hydraulic test at 380 psi (twice its normal working pressure) at the Stockton factory on Teeside. It is hoped the boiler will be delivered to the WHR soon so that assembly of No.130 can be completed for the 2019 season. The basic structure of the new cab was complete by the same date. See No.130 Facebook page for images. 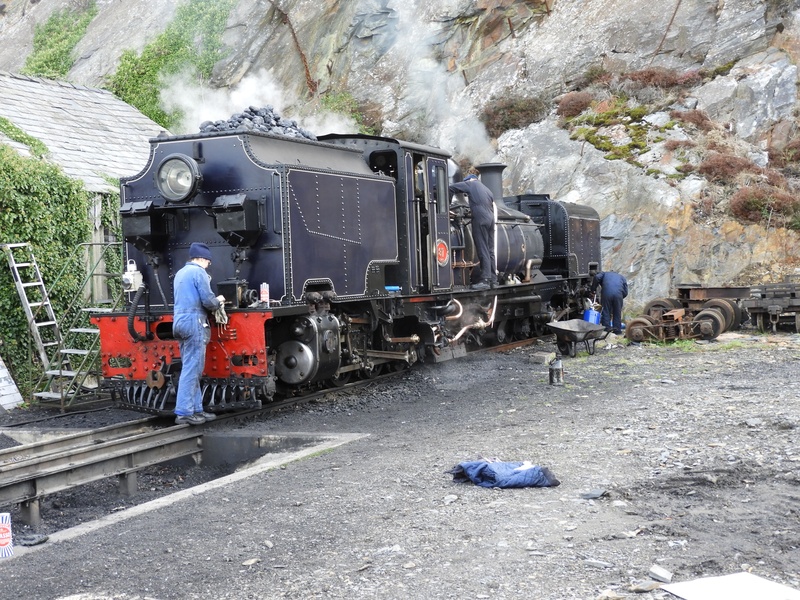 The Hafod-y-llyn Orange timetable sees two trains a day at 1115 and 1405 WThSO from Porthmadog. 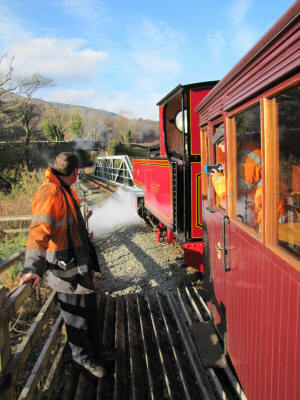 A small engine is sufficient for the duty as the line is level with 1 in 40 gradient beginning just beyond Hafod-y-llyn. Prince has been allocated for trains until 15/11/18. The Winter Major Works Programme has now started in earnest now that the end of season has seen a reduction in services. Embankment reconstruction in the Pont Croesor area was completed in time for the SWTO train service to Hafod-y-llyn on 10/11/18. Of interest to ex-Deviationists (such as your webmaster!) 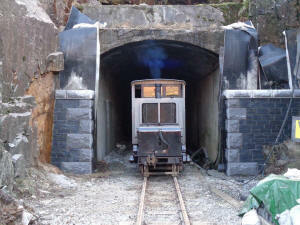 is rock trimming on the FR at Moelwyn Tunnel North Portal, which has been completed. The concrete foundation for the long awaited portal stonework has been cast. Many see this as the final completion of the Deviation Project. Next week volunteers start building the North Portal. Also on the FR at Whistling Curve the track has been lifted and formation is being prepared for new plastic sleepers. 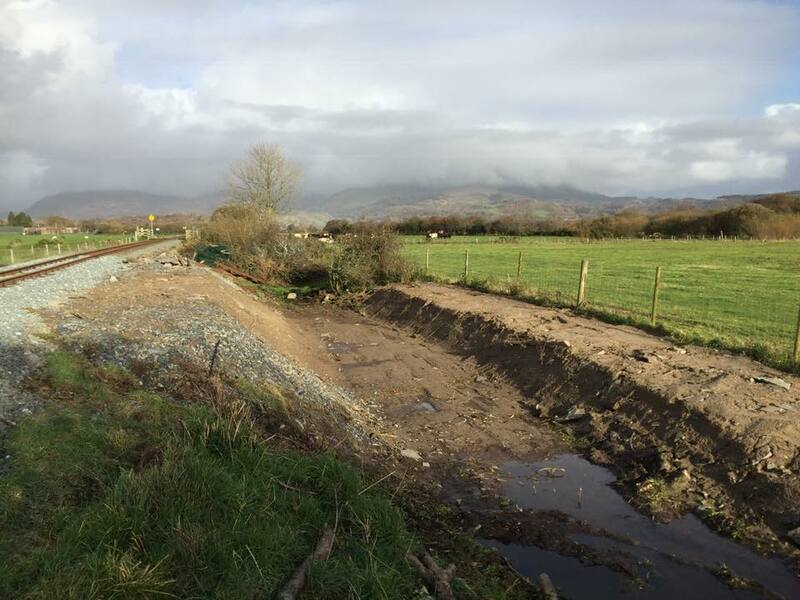 This northerly view (9/11/18) shows the strengthened embankment just south of Pont Croesor with track relaid with fresh ballast and tamped. This is part of the original sand embankment built for the Croesor Tramway and was undermined by badgers who have been moved on with a special licence. Click on the image to enlarge and click again to see full size (where available). This image is copyright F&WHR and was taken on a digital camera. Image post processed and displayed at 96dpi. This northerly view (9/11/18) shows the strengthened embankment with the original borrow pit now cleared to act as a field drain. Click on the image to enlarge and click again to see full size (where available). This image is copyright F&WHR and was taken on a digital camera. Image post processed and displayed at 96dpi. Last weekend volunteers had a brief respite from trackwork and supported the Armistice service at Tan-y-Bwlch by organising the display of the WW1 rolling stock in the siding there, including Mountaineer (with smoke issuing from chimney!) that hauled trains in the early years on the WHR. The pace accelerates this weekend when the F&WHR welcomes a party of 19 from the Young Rail Professionals to the railway to lay track at Boston Lodge at the recently levelled south headshunt of the Carriage Shed. This includes new pointwork, presumably for the new Carriage Shed to be built on the recently reclaimed land. This westerly view (11/11/18) shows Mountaineer and Moelwyn as part of a tableaux of First World War trench railway stock at Tan-y-bwlch to commemorate the armistice and dedicate a memorial to those that fought and died from the FR &WHR company staff. The smoke issuing from the chimney is probably an oily rag as this loco has been sidelines at Glan-y-pwll depot for many years. Click on the image to enlarge and click again to see full size (where available). This image is copyright F&WHR and was taken on a digital camera. Image post processed and displayed at 96dpi. 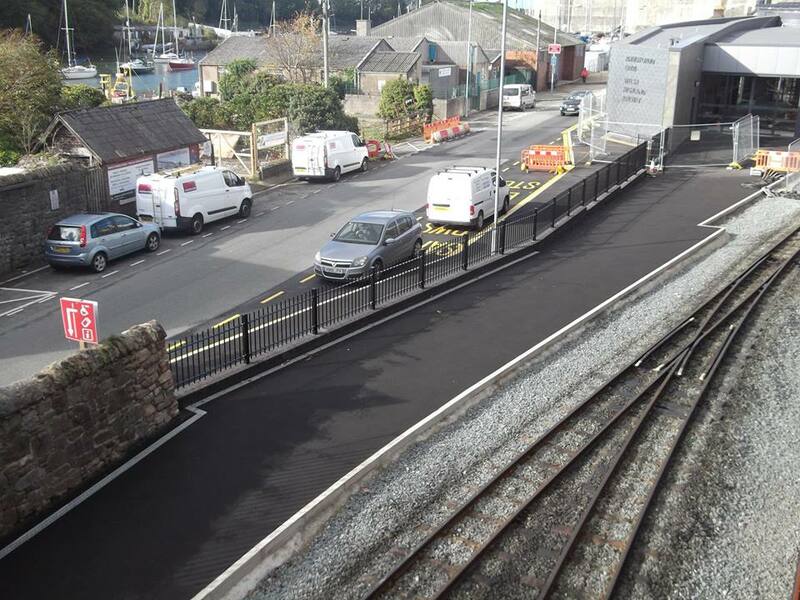 This southerly view (3/11/18) shows the completion of the station at Caernarfon on the day the Practical Completion Certificate was issued and security fencing was removed. Work has been underway for some time fitting out the structure. Unfortunately work stated across the road on rebuilding the triangle site with artisan workshops etc so the area still looks like a building site. Click on the image to enlarge and click again to see full size (where available). This image is copyright Stuart McNair (F&WHR) and was taken on a digital camera. Image post processed and displayed at 96dpi. Apologies for gap in updates. Slide scanning has now reached the 1990s are soon your webmaster's archive of never before published WHR construction photos will be available. The increased scan rate comes from having a second four slide magazine for the Minolta DiMage Scan Dual III (as well as a spare scanner, just in case!...one failed after 2,000 slides were scanned!!). So the second set of slides can be cleaned and prepared whilst the first is being scanned. Some of the slides appear on the North Wales Coast Railway website that also covers Cambrian Coast and narrow gauge news each week. Others appear on the Railways of North Wales Facebook page (members only). 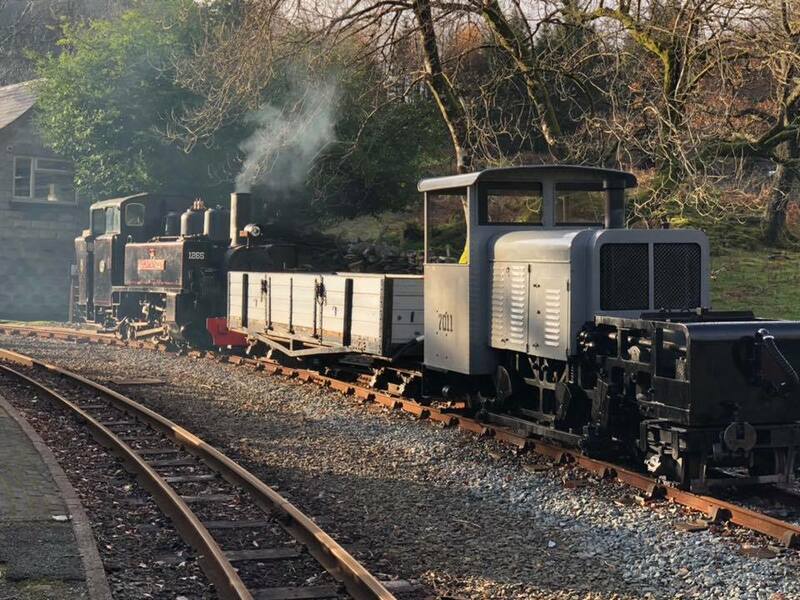 The WHR's main season trains finished on Saturday 3/11/18, however FR trains continued until 8/11/18. The WHR's Orange timetable starts on 10/11/18 and trains runs from Porthmadog to Hafod-y-llyn SWThO for 3 weeks until 24/11/18. Trains depart at 1115 and 1405 and the timetable advises that they can only be joined at Porthmadog. 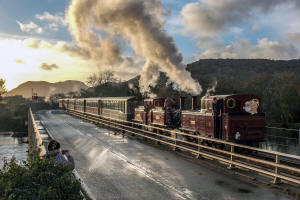 See F&WHR website for details and the Low Season timetable poster is available here. The service is hauled by small FR locos and turns back at Hafod-y-llyn as they cannot handle the load on the 1 in 40 north of that point. This northerly view (5/11/18) shows three Garratts at Dinas as seen from South Yard. Left to right are Nos. 143/138 and the frame of No.87 after removal of the boiler and superstructure for its 10 year overhaul. 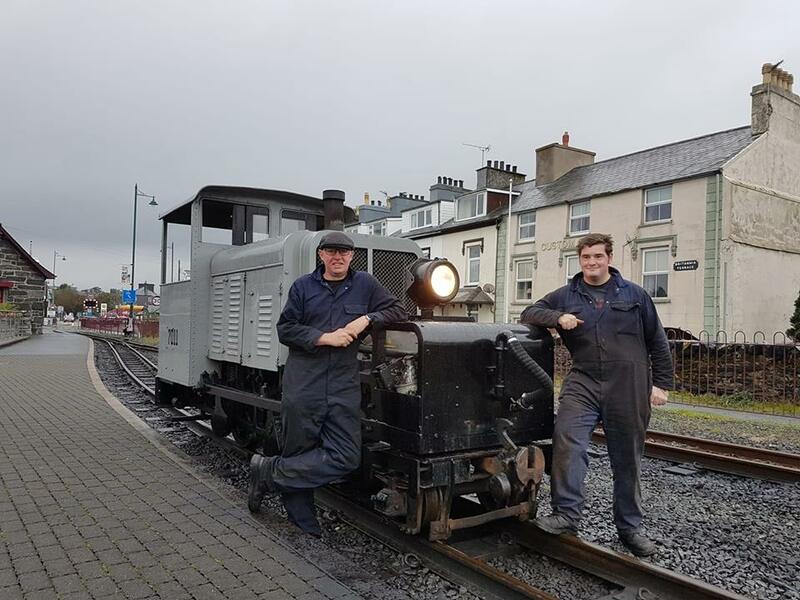 Ex-Shotton Steelworks shunter Bill is works pilot. Click on the image to enlarge and click again to see full size (where available). This image is copyright Keith Holland and was taken on a digital camera. Image post processed and displayed at 96dpi. The WMWP has commenced and, with a very busy few months ahead, the PW team has started work. The track at the rear of Boston Lodge Carriage Shed was lifted on 5/11/18. Three new points will be installed and operational by Christmas allowing access to the new extended Carriage Shed when construction starts in the future. Some 200 tonnes of Minffordd quarries ballast as been delivered and 700 new plastic sleepers drilled and awaiting loading for delivery to the site. This northerly view (5/11/18) shows the headshunt lifted alongside the Heritage Carriage Shed at Boston Lodge. 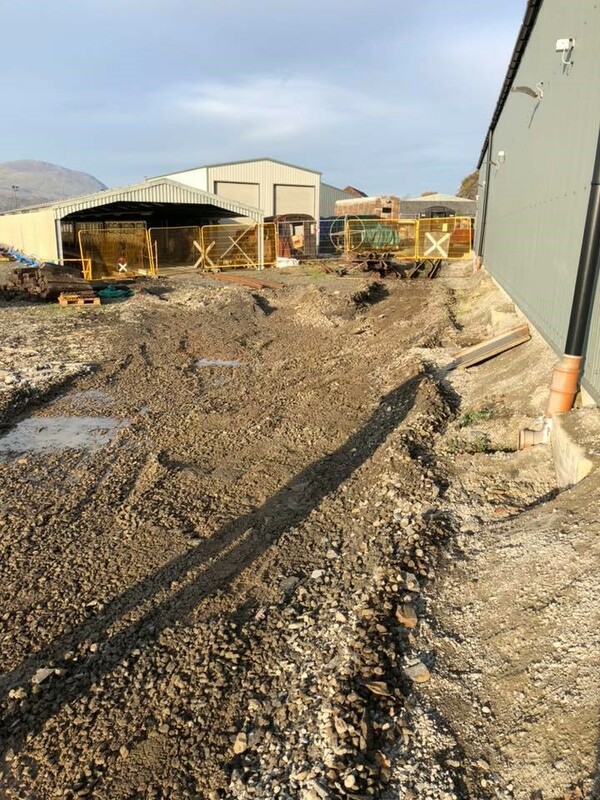 Three new points will be installed here with eventual access to the new Carriage Shed to be constructed on made ground to the left of the existing carriage shed. Click on the image to enlarge and click again to see full size (where available). This image is copyright F&WHR and was taken on a digital camera. Image post processed and displayed at 96dpi. By 1/11/18 the final blanking plates had been fitted plus the dome nuts tightened and are all downwards now for neatness. The boiler is being painted in gleaming red. It cannot be long now before the hydraulic test. By 2/11/18 the boiler backhead was now complete and the Boilermakers plate applied. The final wash out plugs of the foundation ring was made and the remaining plugs fitted. By 3/11/18 work on the boiler was nearing completion. All of the wash out plugs drilled, tapped and inserted and the smokebox end is finished until the hydraulic test is complete. Then the header and elements will be added. 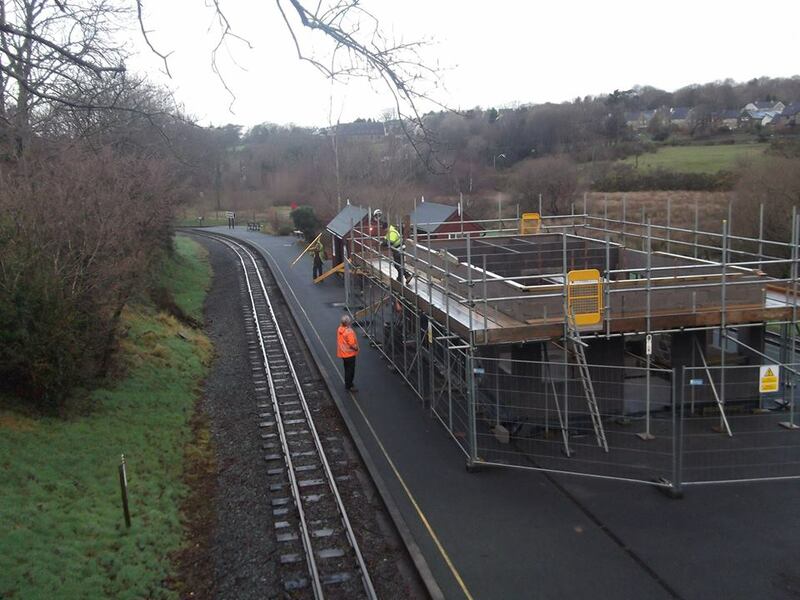 By 6/11/18 the cab roof was being constructed back at Dinas. On 1/11/18 the 10:00 train from Caernarfon did not depart until 11:00 hauled by diesel Vale of Ffestiniog, presumably after the Funkey was rushed up from Porthmadog. The return train to Caernarfon - the 14:15 ex-Porthmadog - was also be diesel hauled. The 10:00 ex-Caernarfon and 14:15 ex-Porthmadog trains was to continue to be diesel-hauled until further notice until the end of the timetable on 3/11/18. The incident emphasises the need to have a mainline diesel at Dinas capable of hauling a full rake. Castell Caernarfon's return to service cannot come quickly enough as it has now been out of service for about 2 years. The NG15 Group was back to its normal working party in October after the excitement of Superpower with work consisting of refurbishing components associated with the boiler. One thing they had been asked to do was to clean the main superheater header and lap the taper for the tube ends. There was quite a bit of scale on the casting so the first job was cleaning/chipping that off. After that the group cleaned the lighter rust off the surface then gave it a coat of primer to stop further deterioration. On the Sunday, and after the rain had stopped as the unit is outside the shed, volunteers looked at lapping the faces. It soon became apparent that there was far too much pitting so they would need the faces machining first. Unfortunately volunteers could not find a tool/cutter combination that reached far enough to actually machine the faces so, with some frustration, the group had to leave this whilst they investigate a better method to do the job. The main manifold casting also needed attention. Work consisted of cleaning off rust and any existing paint then giving it a coat of protective primer. Volunteers had also started to clean the whistle last month so this job was continued. Volunteers also lapped in the valve faces and, once all the paint was dry, reassembled it all. Other boiler fittings looked at were the handrail stand-offs. These were also cleaned and given a coat of paint. One fitting, from the inside of the boiler, was the main steam pipe that runs from the regulator to the front tube plate. Once volunteers had cleaned off all the scale they realised this was not in good conditional. Some of the scale removed from the inside belonged to a previous repair that had presumable been implemented to seal a hole in the pipe. Volunteers need to replace all or part of this. At the same time they tried to locate the regulator assembly. This had been removed when the boiler was first worked on at the end of the 1990's during an abortive volunteer effort. Unfortunately it could not be found so the group investigated the use of an NGG16 regulator. Fortunately it looks like one will fit with minor modifications and so will give a degree of standardisation. Amongst numerous other small jobs group members checked out the side compensation springs which had been delivered the previous month. However the saddle had been assembled the wrong way round so they had been returned to the manufacturer and promptly returned back to us corrected. See NG15 No.134 website for images. 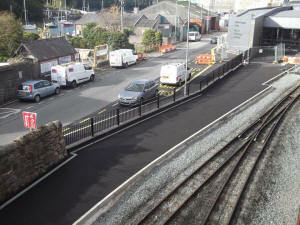 This northerly view (28/10/18) shows the completion of the station fence at Caernarfon. The WMWP will see the track realigned against the platform edge, the point moved north and the headshunt extended to take two Garratt length locos after Xmas. Click on the image to enlarge and click again to see full size (where available). This image is copyright Stuart McNair (F&WHR) and was taken on a digital camera. Image post processed and displayed at 96dpi. The Blaenau Ffestiniog &Trawsfynydd Railway project has evolved to become the Bala &Ffestiniog Heritage Group with a new website and a plan to form a Trust to restore the line to Trawsfynydd. An AGM is planned in the near future. Many enthusiasts hope this attempt to restart the project might be successful after NR withdrew track access permission from the previous group. See B&F Heritage Trust website. New members are invited to join with annual membership set at £20 payable via PayPal etc. Good progress is being made with No.130, which F&WHR management hope will be finished in time to support the fleet next year as No.87 is now out of service for its 10 year overhaul. By 26/10/18 work on erecting the cab was in progress on the boiler cradle and the prefabricated bunker, made locally, is having various fixtures added. The late running boiler was also receiving attention. Progress has been made with the wash out plugs. So far 34 have been drilled and tapped with just 2 to finish on Monday 29/10/18. A portable radial drill was used. By 29/10/18 work on the steam dome was nearing completion with regulator, J pipe etc. fitted and connected up, aligned. Blanking plates are being made and then the dome can be fitted. Work on the boiler had also progressed. The backhead and right hand side washout plugs were all complete. Trial fitting of the water gauge frames onto the new studs also occurred. Despite Keolis/Amey saying they will not continue with loco hauled Holyhead-Manchester workings, the Class 67 hauled trains continued under the new TfW organisation with de-branded ATW coaches presumably hired in from Arriva. 67020 hauled the train on 24/10/18 and 6/11/18 with 67014 on the Premier Express Holyhead-Cardiff service 26/10/18. TfW has been hit with a stock shortage (including the delayed introduction of the refurbished Class 319s) and cancelled lots of trains on Saturday 4/11/18 including bustituting the Conwy Valley line. Colas operated the Rail Head Treatment trains with Nos. 56078/87 on the North Wales Coast on 6/11/18. These locos tend to stay on the working unless a failure occurs. One coach bogie of the four coach Branchline Society 'trackbash' railtour 'The Ruby Vampire' derailed at Shotton steelworks reception sidings on 4/11/18. The rake was top and tailed by WCR's 33025 and 47826 so the train was unable to continue to West Kirby, an unusual destination from Wrexham! The 33 initially took one coach of passengers back to Wrexham but after NR turned up and rerailed the offending bogie, the coach was sidelined and the tour continued to Crewe missing out the West Kirby leg. The Vale of Rheidol Railway in Aberystwyth has been given the green light for European funding of £1.6m to allow work to start on a new station and multi-function display facility. The new station will be to the east of the existing station, alongside the former GWR shed, which the VoR use as their depot. The existing shed will become a visitor centre. The EU funding is being invested in the development through the Welsh Government’s Tourism Attractor Destination programme, led by Visit Wales, which aims to create 13 must-see destinations across Wales. This is the third move of the VoR station new station which moved into the Manchester and Milford platforms in the late 1960s after the closure of that route. The station will be adjacent to the large car park on Park Avenue and will be more convenient for passengers arriving by car. According to artist's impressions, it will consist of a platform sufficient for standard VoR 7 coach rake with run round. There will also be a short bay platform. The station will be finished in 1930s GWR style complete with tin sheeting pagoda roof buildings! A new carriage shed will also be built and it seems the existing shed will be used for display of the VoR's collection of locos including the recently purchased Garratt. All three locos, Nos.7-9, have recently been released in GWR green but without nameplates. None of them have yet visited the F&WHR despite the visit of Palmerston to the VoR some years ago. The VoR is cancelling its Santa Specials this December because of redevelopment of the station. See Peter Johnson's VoR pages for images of construction works. 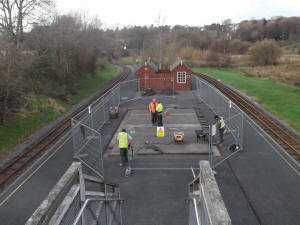 The old platforms built in the Manchester & Milford platforms will be removed and the area will be used by the scheme to build a new 3-road 130m x 11.5m carriage shed. This will store 12x standard length VoR carriages per road. The Aberystwyth-Carmarthen route proposed for reopening in future will require additional platforms at Aberystwyth according to the recently published Feasibility Study (see below) but these will need NR to reacquire Platform 3/4 from commercial use. There is currently a rush to ensure that Britain's EU Grant allocation is fully spent before the supposed Brexit Day next March, if indeed Brexit goes ahead. Railways such as the Bala Lake Railway with its Town Extension scheme must be wondering if such largesse towards Heritage Projects will continue, funded by central government, if we leave the EU. 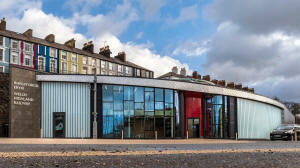 See Cambrian News story for artist's impression. PW loco Moel Hebog is receiving attention in Boston Lodge. Attention has been given to the starter motor, clutch and gearbox. The ex SAR wagons that have operated as a rail carrying bolster pair (DZ1418) are corroded and are to receive a new chassis (built over the summer by French student volunteers) with parts from the old using welds rather than rivets. Ex Dinorwic loco Velinheli is having a new boiler and work will progress over the winter on this project. 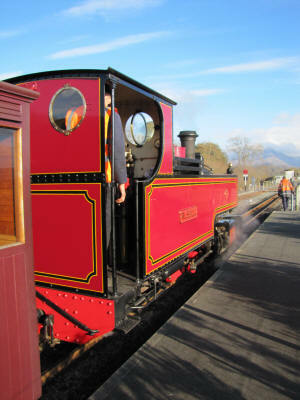 The loco was the first steam loco to visit Beddgelert back in 26/4/07. The Romanian PW wagon (No.4023) is having its wheelsets re-profiled. Work will take place over winter on the chassis of Welsh Pony, which returned to the main workshop on 23/9/18. This project has slowed down a lot in the last 12 months as the operational fleet has required maintenance. Merddin Emrys is in Boston Lodge for an overhaul and a bogie crack repair after the Vintage Weekend. Lyd has a suspected superheater leak. No.87 is being stripped for its 10 year overhaul at Dinas. No.130 will make rapid progress when its delayed boiler arrives from Northern Steam Engineering of Stockton-on-Tees (due imminently). It is hoped No.130 might be available next season to take the place of No.87. With ten year limit for Nos.138/143 coming up in the next few years, early provision of replacement boilers has been ordered with the ex-Puffing Billy No.129 with the 1968 built Hunslet boiler currently at Loco maintenance Services of Loughborough going into No.138 when it falls due. No.143's boiler (ex No.140) is going to Israel Newton's for heavy overhaul a year after No.138's. WHR coach No.2040, one of the original Winson built coaches of 1997, is in the coachworks for overhaul. The corroded sliding windows and being replaced with hopper windows as with other Winson rebuilds. 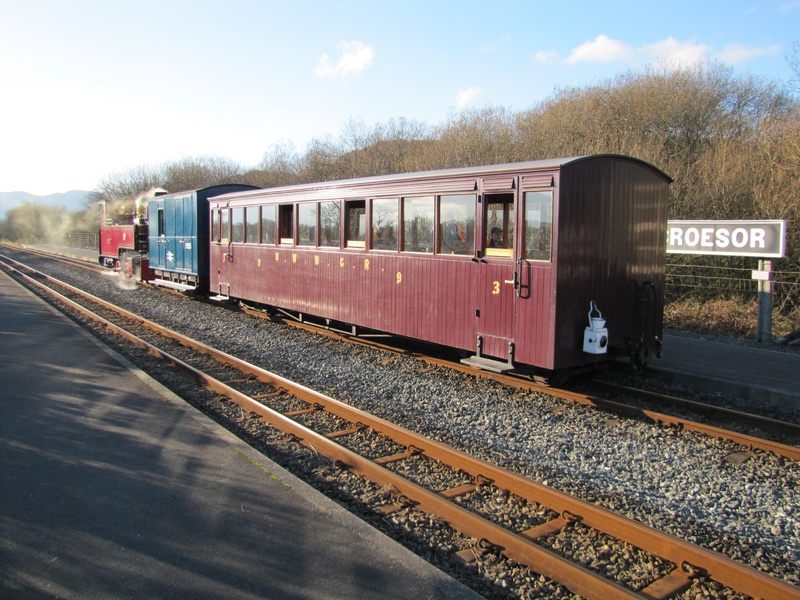 There has been increased pace of work on the new WHR Observation car Gwyrfai (No.2152) with the curved front window ordered and progress with the roof. This vehicle may be launched in 2019 season, though work is likely to slow down while the second Ravenglass & Eskdale coach is started. 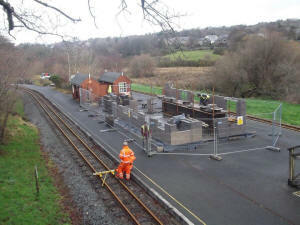 Work on the new Bow Street station a few miles outside Aberystwyth started on 2/11/18. The £7.95 million transport hub will be useful as a park and ride for Aberystwyth where parking is difficult, especially at holiday times. Tracks will be levelled throughout the new station site, which is not on the original Bow Street station site. See Cambrian News story. Keolis/Amey hit by stock shortages from Day One! Keolis/Amey has admitted they will not be able to introduce the new Liverpool-Chester service via the recently reopened Halton Curve in December as previously announced due to rolling stock shortages. TfW has confirmed the service will not start until May 2019 but hopes to extend two of the services to Wrexham. K/A has inherited the track access that ATW applied for and also their Class 150/158 modification programme to make the units complaint with Persons with Reduced Mobility regulations which come into force in 2020. The delay with the Class 769 Flex programme (conversions of Class 319 DMU to multi-power modes) has slowed the DMU PRM conversions as K/A was due to receive five 4 car sets. The Liverpool-Chester service is estimated to generate 250,000 new journeys and the aim is to increase frequency and extend services into North Wales easing journeys to the WHR. Trains will call at Liverpool South Parkway, Runcorn, Frodsham and Helsby with a journey time of 50 minutes. Keolis/Amey running train services for TfW since 14/10/18 have confirmed that Class 158s will continue to work the Cambrian Coast Line west of Shrewsbury because of their ERTMS system for the immediate future. The Cambrian lines will therefore be the last to receive the new Class 195 CAF Civity DMUs as planned under K/A Implementation Programme. However, the ERTMS was a unique trial system and is now 'old'. RAIB has revealed various parts are 'backwards engineered' to talk to each other as revealed by the recent serious failure to upload TSRs to train (see story below). K/A is looking to upgrade the system to the latest UK ERTMS system but if they can't they 'have the ability for it to be backwards compatible. CAF will ensure that'. As part of any upgrade to the signalling it is hoped a portable unit will be available as initially promised by NR to allow excursions and regular steam workings to resume, like the Fort William-Mallaig Jacobite workings. Apologies for no update Saturday. Your webmaster was taking part, along with an estimated 700,000 others, in the Peoples' Vote March in London. The Mott-Macdonald Executive Summary for Welsh Assembly Government makes stark reading to supporters of the TRAWS scheme to reopen the Aberystwyth-Carmarthen Line with a price tag of £776m and numerous flood and environmental issues to sort out, along with a Benefit/Cost ratio estimated to be only 0.43! The scheme will only go ahead if there is the political will behind it to improve Wales' fragmented connectivity. A later stage would be TRAWS' scheme for Afon Wen to Bangor to reconnect the Cambrian Coast with the North Wales Coast line. Either of these developments could bring additional tourism to the WHR by way of direct rail travel or railtour traffic. The report has been around since its first draft almost a year ago (22/11/17) and incorporated TfW comments, wider economic impacts and WAG comments. 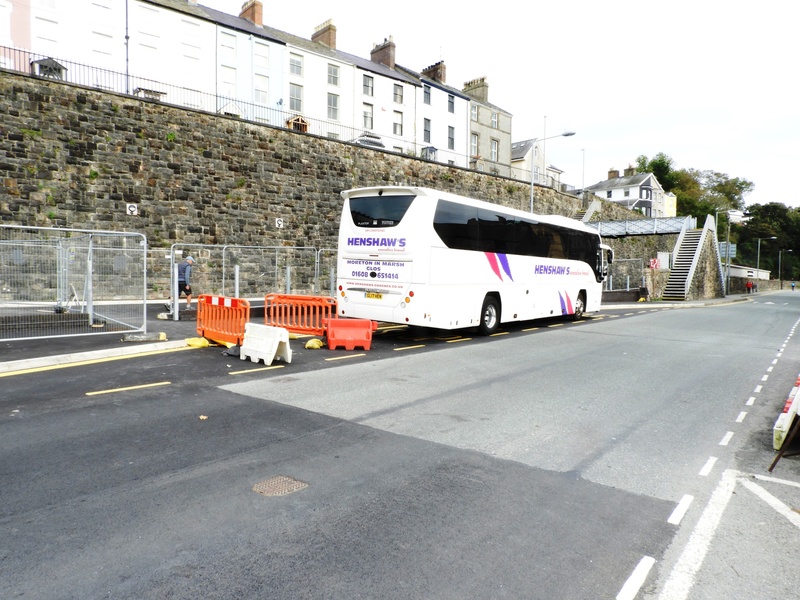 The conclusions of the report suggest the route could be reopened, largely on its original alignment but with a major diversion at Aberystwyth and minor diversions elsewhere where land has been developed. The study rejected options which cross the Cambrian Mountains to join the Central Wales Line even though alignments at 1 in 50 ruling grade exist south of Lampeter via Talley as they would not directly serve Carmarthen, though providing faster links to Swansea/Cardiff. The report has decided it would be impossible to share the route with the current Gwili Railway and part of the £776m cost would be to move the Gwili Railway to one of the three branch lines. This is taken to mean to either the Newcastle Emlyn branch from Pencader, the Aberaeron branch from Lampeter or Carmarthen-Llandeilo branch from Abergwili Junction (possibly with a junction for through working in each case, Ed?). Initial operational assessments have determined that the reinstated route could provide a regular hourly train service between Aberystwyth, Llanilar, Tregaron, Lampeter, Llanybydder, Pencader and Carmarthen, with an end to end journey time of around 85 minutes. Loops are likely to be needed at some of these intermediate stations to allow for the services to pass, out of course working and the possibility of freight/excursions. Two passing loops are the minimum (Tregaron/Llanybyther? Ed). Trains could be extensions of services currently working into Carmarthen from Manchester with local infills (hostage to fortune this as late running trains from Manchester are often turned back early-ED!). The signalling system would not be ERTMS as used on the Cambrian Coast which is now coming into disrepute (see other stories-Ed). The direct construction cost are £288m and, given fast tracking, the line could be open in 2024 carrying about 370,000 passengers per year. Unfortunately this is about half the number needed to meet a B/C ratio of 1. To achieve this almost the whole working population of Aberystwyth would need to use the railway on a weekly basis and in excess of the total populations of Tregaron and Pencader. However, no allowance seems to have been made for tourist potential, circular railtours, or freight usage. The Borders Effect in Scotland on the recently reopened Borders Railway has seen traffic greatly exceed predictions and regular steam excursions. Click on the YouTube link to watch 32 mins 51 seconds of video covering Works Reports etc. This YouTube was published on 18/10/18 and was taken by John Wooden (F&WHR) on a professional 4K camcorder. It is best watched in 2160p 4K HD in Google Chrome browser as only 720p HD available on Windows. Alternatively, View on YouTube where all options are available. An interim report by the RAIB seems to show that the ERTMS signalling system installed to save money on the Cambrian Coast could be dangerous. During a reboot, the system failed to upload the Temporary Speed Restrictions (TSRs) to trains and so trains ran through level crossings at excessive speed. Fortunately there were no PW TSRs on the day concerned otherwise a serious derailment might have occurred! The ERTMS system on the Cambrian Coast route was implemented despite protestations that it would restrict visiting railtours unless a portable device was developed. NR reneged on its promise to provide such a device and the railtour market has collapsed much as the local Tourist promoters such GLToW predicted (just one railtour last year and none for several years before!). The nascent WCR steam Cambrian Coast Express was prevented from operation after 3 successful years (this operation was similar to The Jacobite Fort William-Mallaig route in Scotland). See RAIB website for full details. All four Halloween trains had sold out on the F&WHR by22/10/18. There are three on the FR (25-27/10/18) but only one on the WHR on 31/10/18. The F&WHR advised passengers in advance that all trains would be cancelled on Friday 12/10/18 because of Storm Callum. In the event while the storm was a little less serious in North Wales than last October's storm, trees were brought down. A large tree was found to have blocked the track near Fron Goch Garden centre and about 10 trees blocked the track on the FR near Whistling Curve. 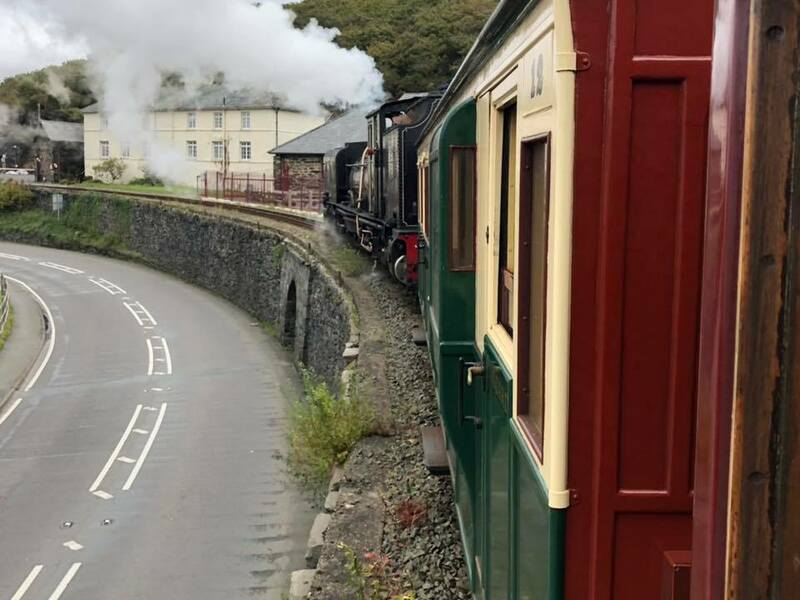 In the event, all trains were cancelled on both lines on Saturday except the 10:50 from Porthmadog which was booked to run to Beddgelert and possibly extended to Rhyd Ddu, if inspection trains found the line was clear in the Beddgelert Forest. Sunday saw a determined effort to clear the FR by the PW gangs but trains operated as normal on the WHR. By Monday both lines were operating normally. This easterly view (14/10/18) shows No.138 ready to depart on a Caernarfon train and Vale of Ffestiniog on a PW train in Porthmadog Harbour station. The high levels of water on the inland side of The Cob indicate how much rainfall the area had endured! The waterfalls were still in spate days after the storm had passed. Click on the image to enlarge and click again to see full size (where available). This image is copyright F&WHR and was taken on a digital camera. Image post processed and displayed at 96dpi. The Daily Post has a final report and video. Arriva Trains Wales handed over the keys on Saturday night to Keolis/Amey who operate the trains for TfW (Transport for Wales), on a non-profit making basis. With Storm Callum bringing heavy rain, trees down and landslides to North Wales, NR has closed the Conwy Valley line and Cambrian Coast lines north of Dyfi Junction for Friday and Saturday with bustitution, the last days of ATW's contract. This has impacted Saphos Rail's first Class 40 outing on 13/10/18 which will now run to Llandudno and then Holyhead if possible, missing out the Conwy Valley line. The fully booked train is to be hauled by D213 Andania (40013). See Daily Post report on storm. This westerly view (12/10/18) shows FR PW loco Harlech Castle in its new livery at Boston Lodge. The green livery replaces the previous two tone yellow/grey 'plant' livery but retains the warning wasp stripes on the buffer beams. Click on the image to enlarge and click again to see full size (where available). This image is copyright F&WHR and was taken on a digital camera. Image post processed and displayed at 96dpi. In an unusual moved a lorry wedged under the Llangefni Bridge on the OOU Amlwch branch is to be released by lifting the bridge rather than cutting up the lorry! Let us hope the bridge is replaced as the line is being cleared by volunteers hoping to reopen the line. See Daily Post report. 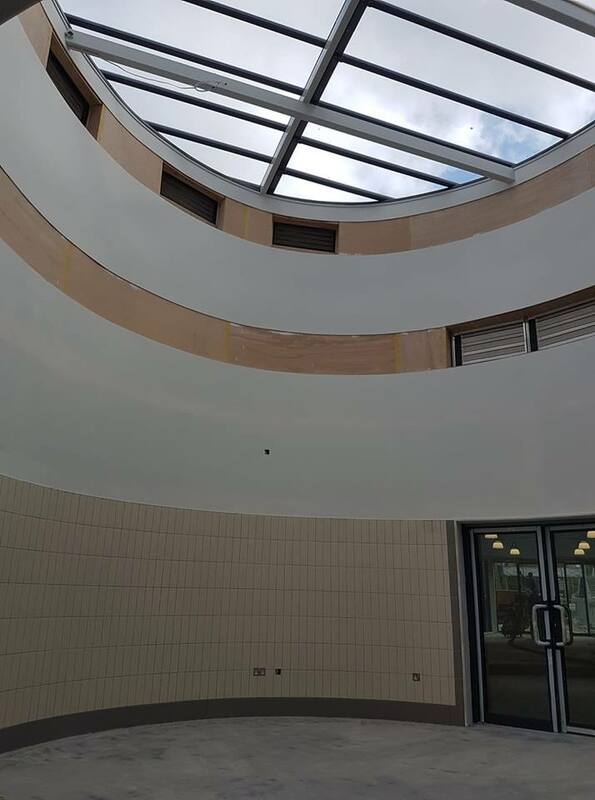 This view (9/10/18) inside the Caernarfon Station shows the central space/entrance hall under the rotunda, now clear of scaffolding for the first time. The area is a light well. The two upper bands will be covered by a ring of painted wooden batons mounted vertically covering the grills. This image is copyright Paul Lewin (F&WHR) and was taken on a digital camera. Image post processed and displayed at 96dpi. The Welsh Government's Feasibility Study into the Aberystwyth-Carmarthen reopening as called for by the TRAWS campaign, was signed off on 19/9/18 but there appears to have been no press coverage and no comment on the TRAWS website. However, Plaid Cymru have backed the project as well as the former Liberal democrat MP for Ceredigion. Full details are available here. A full analysis will be added to the webpage tomorrow. The scheme involves two new platforms for Aberystwyth and a new route out of town via Llanbadarn and a new tunnel to Llanfarian. At best there would be one train per hour each way and the displacement of the Gwili Valley Railway to one of the three branches off the route, with support for the move. There would be five intermediate stations, most likely served by an extension of Manchester to Carmarthen services (the M&M by any other name!). The scheme would cost £775 million and has a poor Benefit/Cost ratio of 0.43, so unlikely to go ahead without cross party political support/external funding. £276 million of this is an 'optimism bias' so the project cost is actually £500 million. The project might be one that would hopefully attract EU Coastal Communities funding should we remain in the EU. The Daily Post reports that the first re-liveried Class 175 DMU (No.175107) was running in North Wales duties from 8/10/18. Keolis/Amey take over WalesRail from midnight on Saturday 13/10/18 and the final loco-hauled ManWAG is likely to run on Friday 12/10/18. This service diagram is likely to be provided by a DMU in future as the coaching stock belongs to Arriva. The diagram itself continues to 7/12/18. 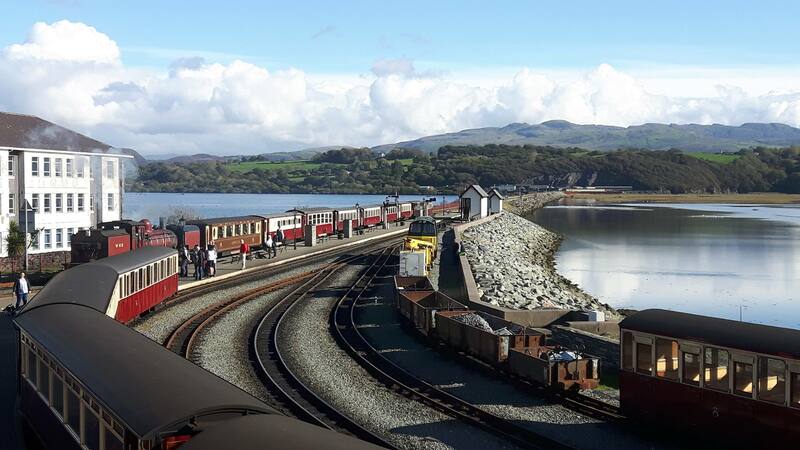 This northerly view (7/10/18) shows No.87 at 1549 ready to haul the Diamond appeal supporters special from Caernarfon to Porthmadog. It was expected that this would be the final working for this loco before its 10 year overhaul this Autumn. The loco is to receive new bogie frames as the current frames are badly cracked. Click on the image to enlarge and click again to see full size (where available). This image is copyright Richard Watson a digital camera. Image post processed and displayed at 96dpi. Richard Watson reports: The annual Diamond Jubilee Appeal Supporters' event took place on Sunday 7/10/17. The tour took in Minffordd Yard, Boston Lodge Works and the new station at Caernarfon. The train was billed as Lyd plus 6 carriages, but in the event Blanche took the train from Minffordd (dep. 09.45) as far as Boston Lodge Halt, where contributors de-trained and the rolling stock put away in Glan-y-Mor yard. At 12.15 the train departed again for Caernarfon, behind Garratt No.87. The Garratt had backed the carriages up to Boston Lodge Halt, and then departed, giving participants the unusual experience of being Garratt hauled across The Cob. This trip was to be No.87's final one before withdrawal for overhaul, having covered a record 110,000 miles in service in the 10 years it has been in traffic. Passing Harbour Station, the WHR service train was, unusually, stabled in the WHR loop. 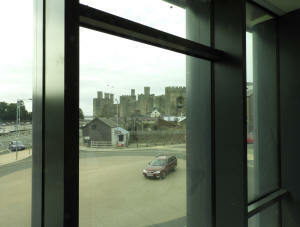 At Caernarfon we were able to see inside the majority of the new building. The Exhibition Hall which opens onto the path from the station platform has doors deliberately made wide enough to accommodate an item or items of rolling stock. We also viewed the shop area, with floor to ceiling translucent panels to the outside, the high specification "Changing Places" disabled loo, and the downstairs and upstairs sections of the new cafe. This easterly view (7/10/18) shows No.87 being prepared at Boston Lodge for its final trip. One aim of the Diamond Jubilee appeal to provide a Garratt sized loco shed over this siding for the WHR that starts from Porthmadog each morning. Click on the image to enlarge and click again to see full size (where available). This image is copyright Richard Watson a digital camera. Image post processed and displayed at 96dpi. This easterly view (7/10/18) shows new build Observation car Gwyrfai being fitted out at Boston Lodge. Click on the image to enlarge and click again to see full size (where available). This image is copyright Richard Watson a digital camera. Image post processed and displayed at 96dpi. This northerly view (7/10/18) from the upper floor of the cafe shows the best view of the Caernarfon Castle from any restaurant in town. Customers will also get a view of the dangerous manoeuvres like this car crossing the roundabout below. Town planners have instituted this shared space idea to confuse drivers and cause them to drive more slowly. Others think it may lead to more accidents! Click on the image to enlarge and click again to see full size (where available). This image is copyright Richard Watson a digital camera. Image post processed and displayed at 96dpi. This southerly view (7/10/18) shows one of the first coaches to use Caernarfon station's bus bay. The steel fence between the station and bus bay has still not been completed. Click on the image to enlarge and click again to see full size (where available). This image is copyright Richard Watson a digital camera. Image post processed and displayed at 96dpi. Moelwyn 100 years old 5/10/18! 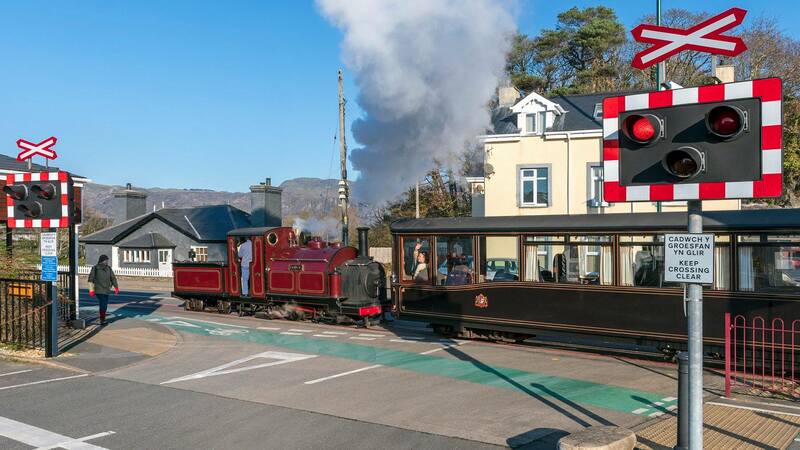 This westerly view (5/10/18) shows Moelwyn in the WHR at Porthmadog on the occasion of its 100th birthday. The loco was built for the First World War and acquired by the FR in the 1920s from a sale of war surplus stock. Now retired from front line PW use, the 2-4-0DM still sees regular outings, including on the WHR, as part of the Heritage Fleet. It was repainted in grey livery in 2016. Click on the image to enlarge and click again to see full size (where available). This image is copyright Paul Lewin (F&WHR) a digital camera. Image post processed and displayed at 96dpi. The Welsh Highland Railway Society’s accommodation facility at Dinas, the property known as Station View has been available for use by both Society members and others volunteering on both the WHR and FfR from 1/5/2018. Bookings can be made via the booking page for on the Society’s website – whrsoc.org.uk under Notices to Members or otherwise by post to: Volunteer Accommodation Dinas, WHR Society, Station View, Dinas, Caernarfon. LL54 5UB. The accommodation comprises: two bedrooms for sharing and one single room; along with shared bathroom facilities; shared kitchen/ dinner and a lounge. Full gas powered central heating throughout as well as fully insulated and double glazing fitted. Bedroom facilities include single bed, wardrobe, chest of drawers, chair, bedside lamp. Please note that towels and bedding, including pillows & sheets are not provided; volunteers should bring their own duvet with sheet and pillow/s or sleeping bag with pillow/s. The beds are provided with a mattress cover only. These are to protect the mattresses and not meant for sleeping on directly. Bathroom facilities include toilet, shower, washbasin and bath. Kitchen facilities include an electric cooker, refrigerator, electric kettle, microwave oven, toaster, table & chairs, ample cupboard space, basic cooking facilities, basic crockery and cutlery, a washing machine as well as basic cleaning facilities. Lounge accommodation includes 2 x sofa, 1 x easy chair, coffee table, DVD & video players plus a television type viewing screen (please note that this does not receive television or satellite signals); there is also a gas fire. There is parking for two cars on-site (additional parking at the rear will be available at a later date) or in Dinas station car park. There is also a ‘dirty clothing’ facility at the rear of the property. Facilities for motor homes and camping (in the area behind the house) are not yet available. CRhE/WHRS member (non members in brackets) 1 Night Single £14.00 (£18), 2 Nights Single £26.00 (£32), 3 to 6 Nights Single £11 (£13) per night, Week single £70.00 (£84). 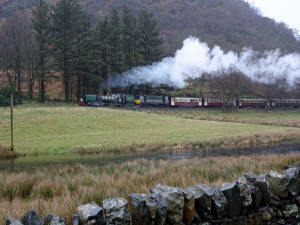 This year's FR Victorian Gala features vintage trains to Beddgelert! 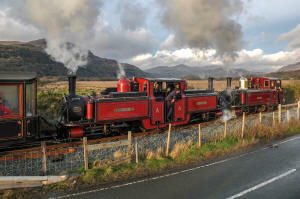 Taliesin will haul the 1000 and 1300 from Porthmadog with Palmerston on the 1600. See F&WHR website for full details and timetable. Lyd will also be hauling an unadvertised private train onto the WHR in the morning, returning in the evening. The F&WHR Trustees special operated on the 3/10/18. Stock was taken to Dinas on 2/10/18 and then worked forwards to Boston Lodge Halt on 3/10/18 hauled by No.87, one of the rare visits of the Garratts to their limit of working on the FR. They are out of gauge for Rhiw Plas bridge. This easterly view (3/10/18) shows No.87 unusually taking Boston Lodge curve with the Trustees Special to Boston Lodge Halt for a works visit. Garratts rarely work to the limit of the loading gauge at Boston Lodge halt though have recovered failed FR locos in this area in recent years. Click on the image to enlarge and click again to see full size (where available). This image is courtesy F&WHR and was taken on a digital camera. Image post processed and displayed at 96dpi. If you have suggestions for development of this site, please contact me by email from the link on the Stop Press page. Please add comments in my Guestbook.